Photograph courtesy of Jake Laughlin. 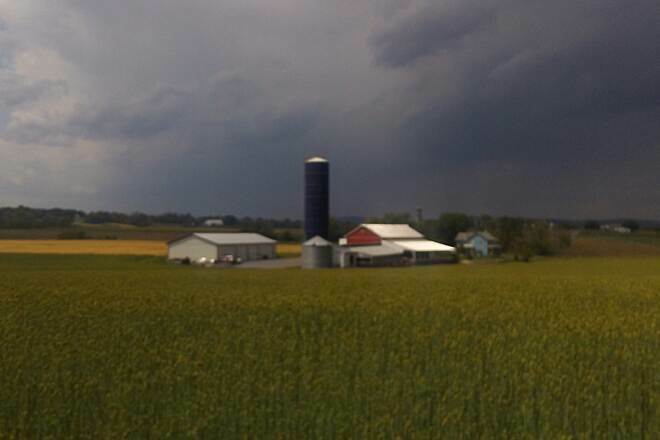 Storm clouds build over the farmscapes along the trail in May. 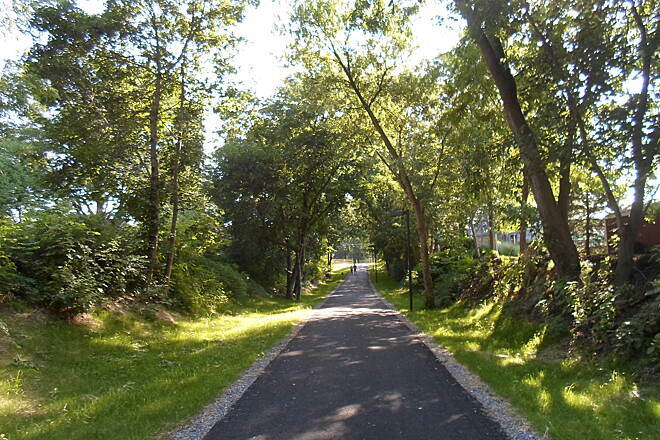 Tree-lined segment near Picnic Woods Road. 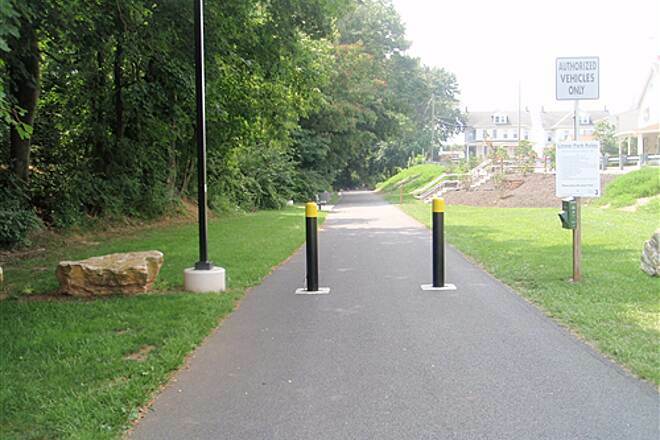 These trees will shade trail users from the heat and sun come summer. 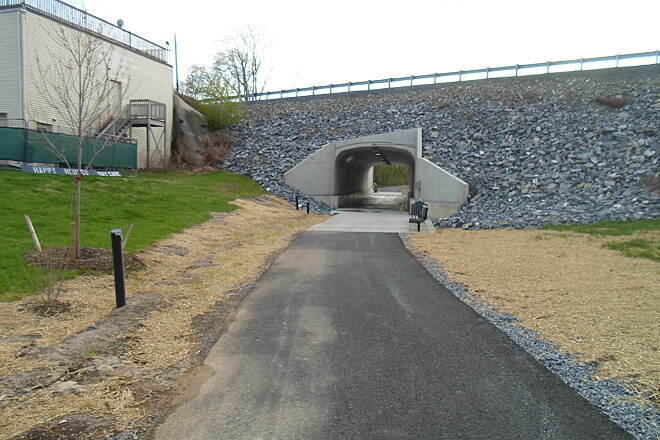 As of May 2017, the western segment of the trail in Warwick Twp. 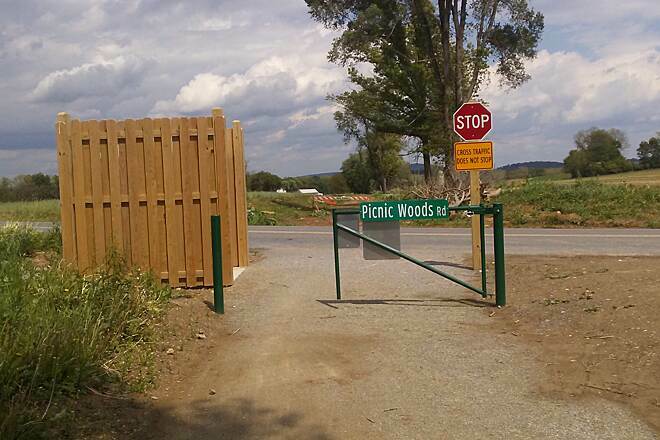 ends at Picnic Woods Road. 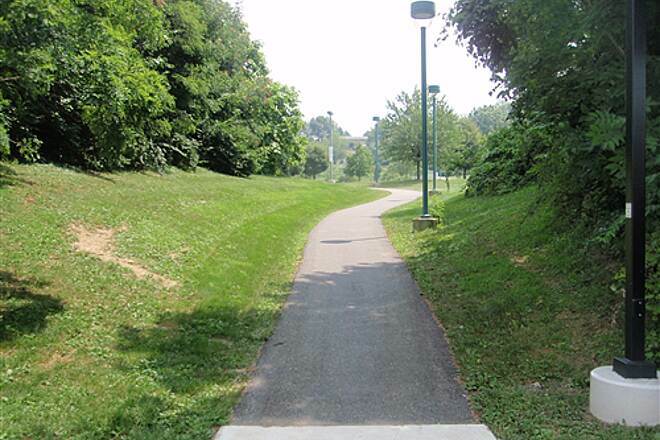 This gap will be short-lived as work has already begun on the next segment, which will extend the trail to Rothsville Road later this year. 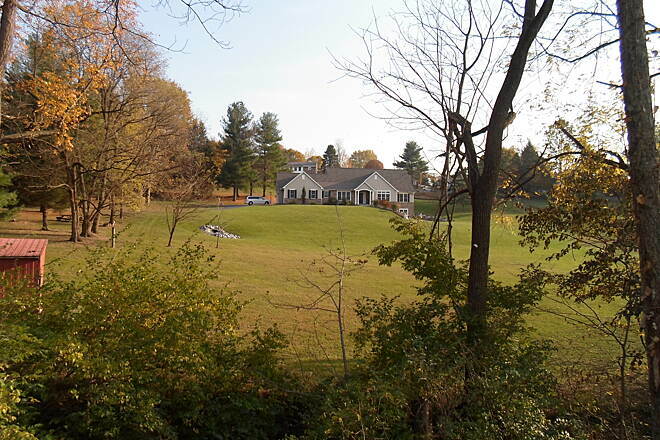 This farmhouse is visible from the trail near Picnic Woods Road in eastern Warwick Twp. 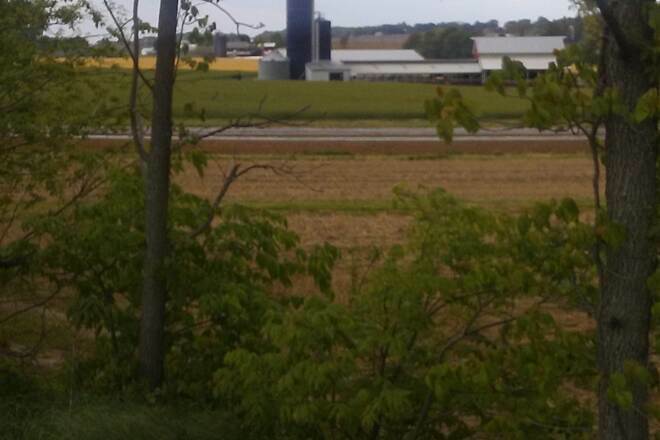 Farm seen through the trees along the trail near Picnic Grove Road in eastern Warwick Twp. 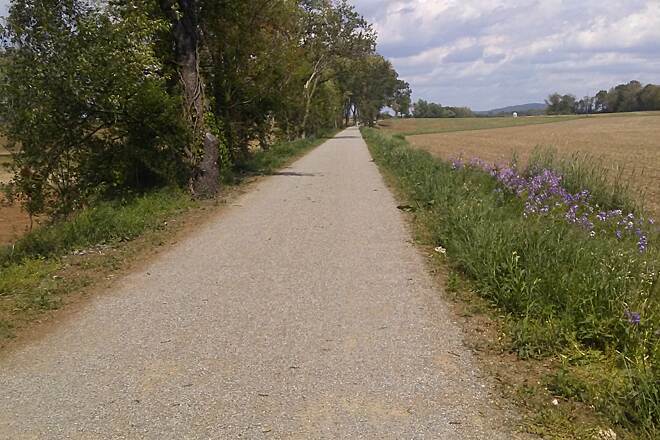 Wildflowers blooming along the new segment of trail in eastern Warwick Twp. 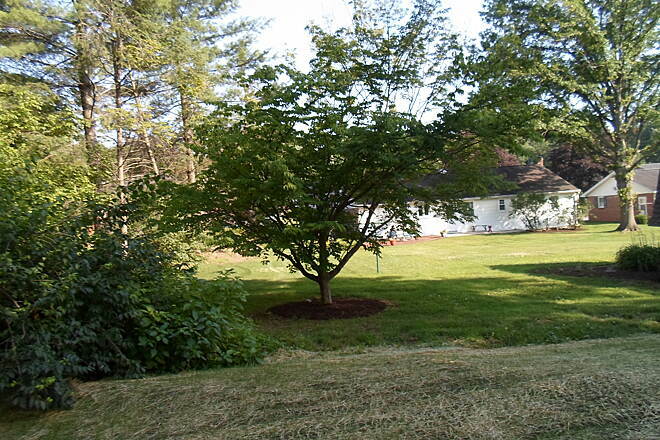 bring the landscape alive in color in springtime. 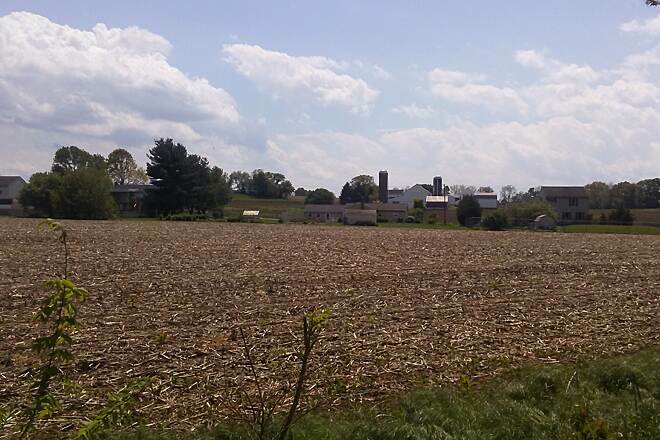 Rolling, rural landscape of northern Lancaster County. 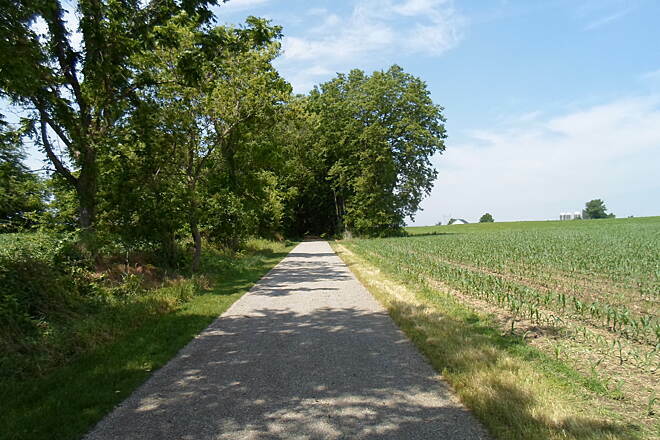 Straight segment between Rothsville Station and Picnic Woods roads. 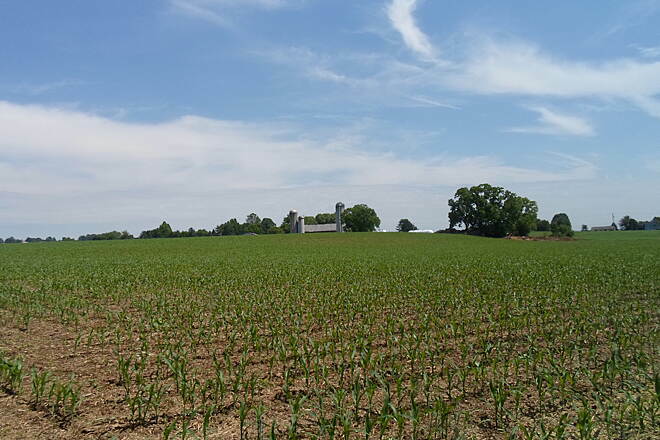 Farmscape on the segment between Rothsville Station and Picnic Woods roads. 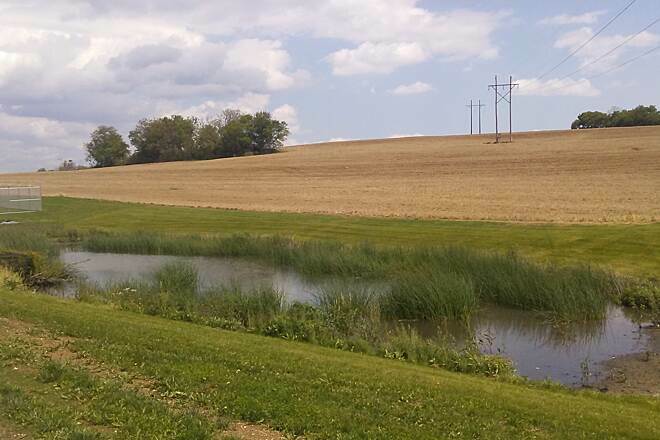 This small drainage pond is off the trail east of Rothsville Station Road. 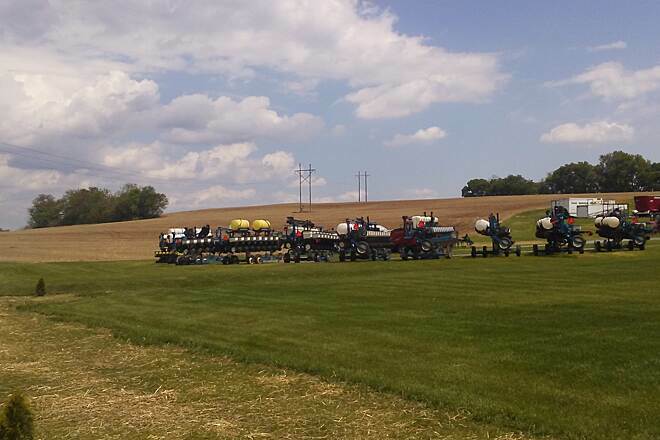 This farm equipment can be seen from the trail immediately east of Rothsville Station Road. 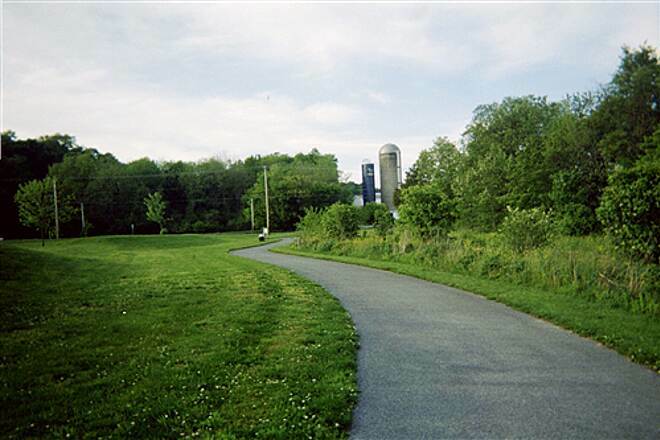 Another bucolic vista along the trail in eastern Warwick Twp. 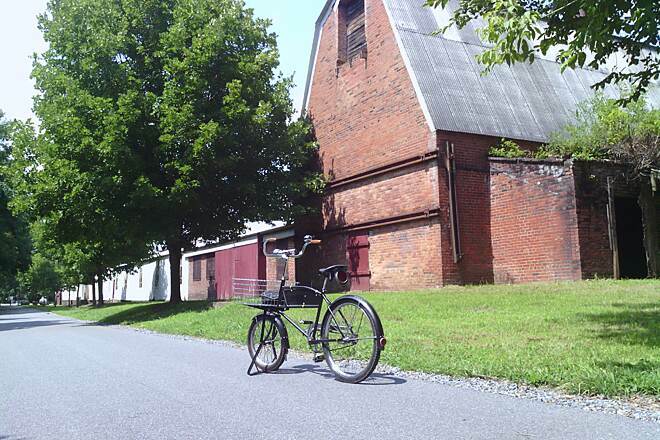 Heading east of Rothsville Station Road in eastern Warwick Twp. 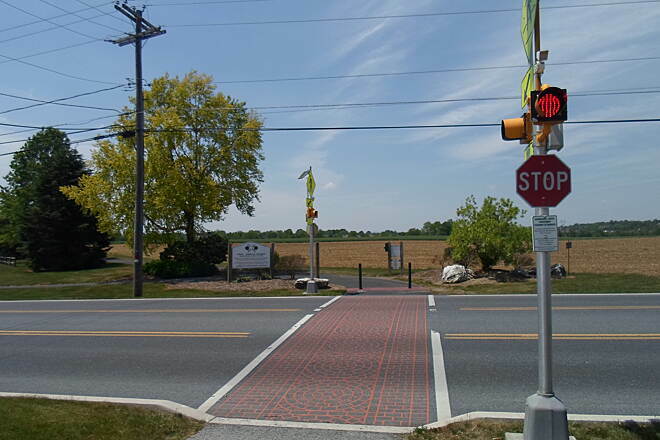 Crossing Rothsville Station Road in eastern Warwick Twp. 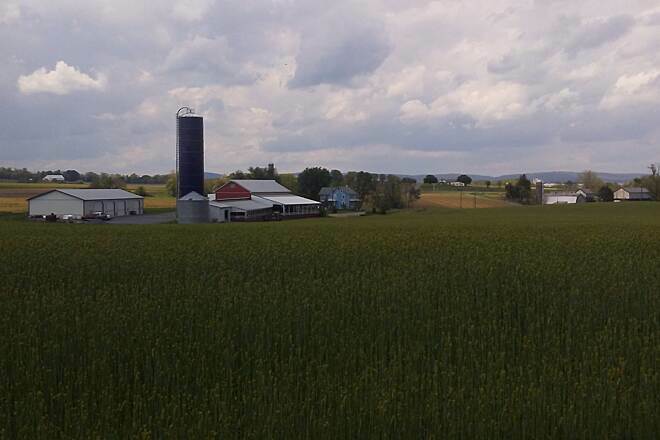 Farms, many of them owned by Amish or Old Order Mennonite families, dominate the landscape in eastern Warwick Twp. Taken May 2017. 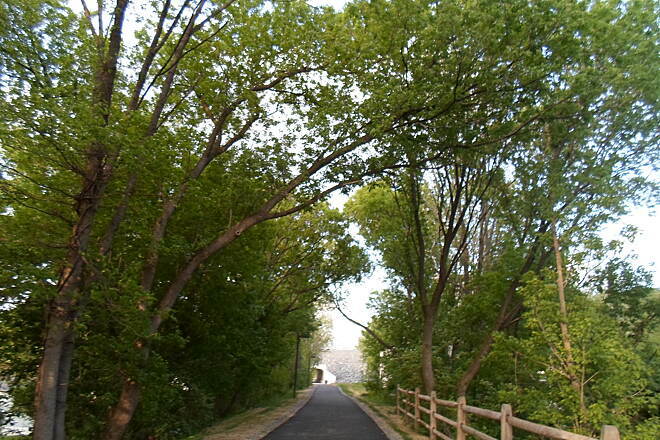 'Green tunnel' effect on the segment east of Newport Road. 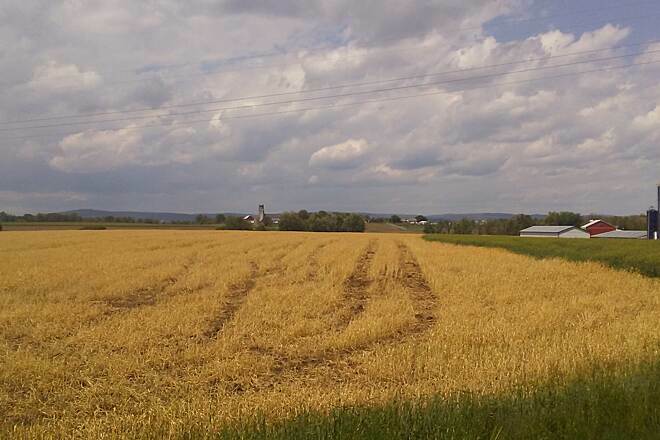 Amber waves of grain ripple across farm fields seen from the trail in eastern Warwick Twp. Taken May 2017. 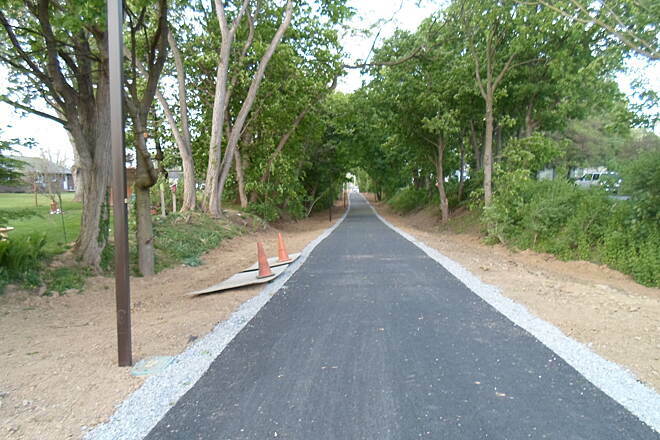 Trees form a green canopy over the new segment of trail east of Newport Road. Taken May 2017. 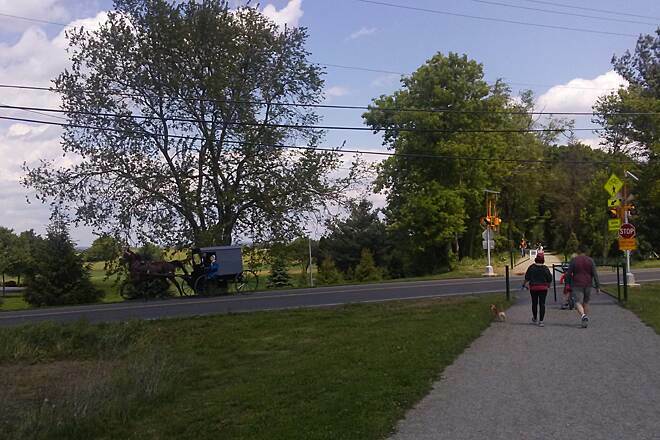 Horse-drawn buggies used by the Amish and Old Order Mennonites are a common sight at trail crossings on local roads in eastern Warwick Twp. 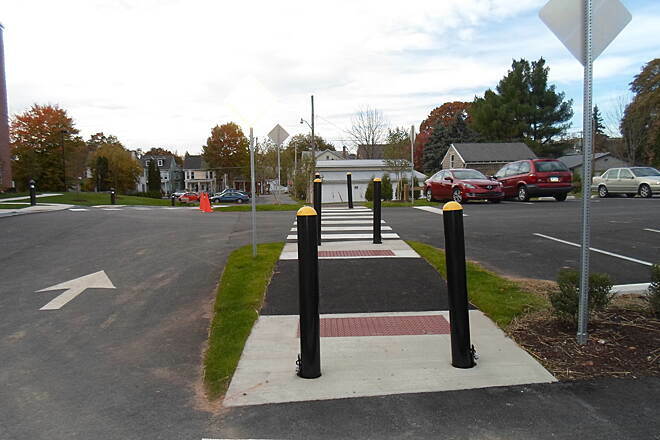 Despite not yet connecting to Akron, the newly completed segments in rural eastern Warwick Twp. 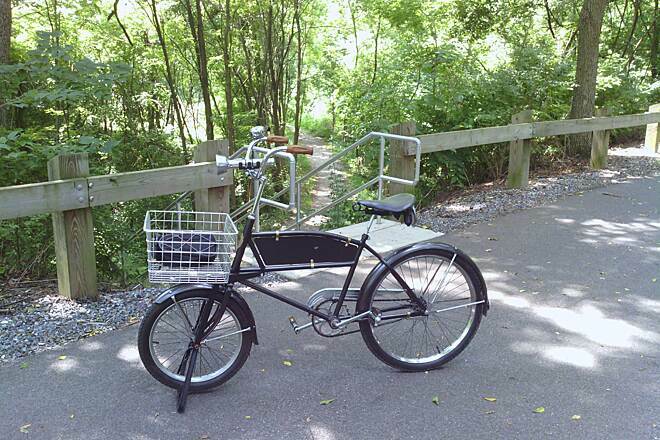 are already proving popular with local trail users. Taken May 2017. 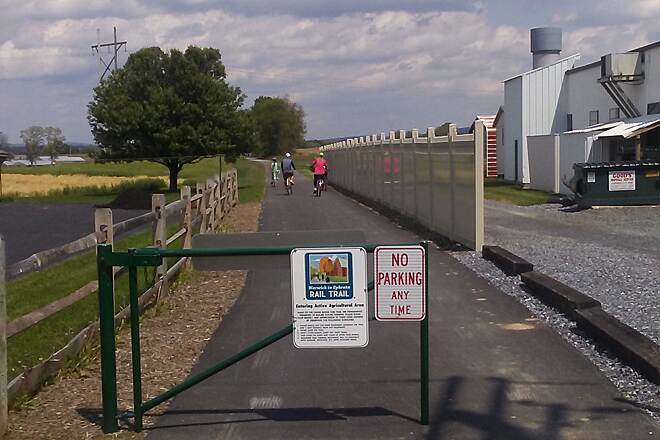 Straight segment of trail in Ephrata Twp. 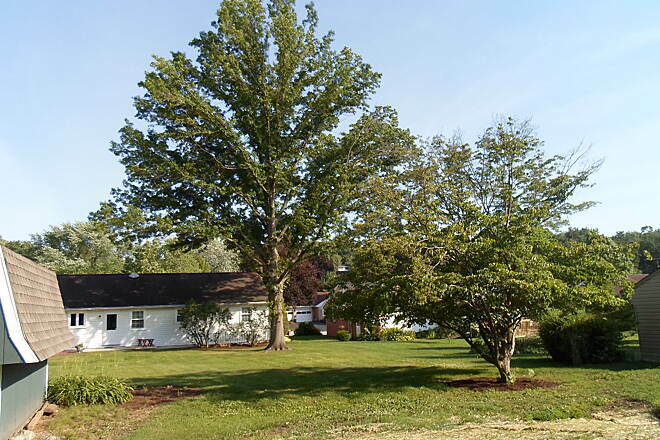 west of Akron. Taken Nov. 2016. Colors of autumn, seen from the new segment of trail west of Akron. Taken Nov. 2016. 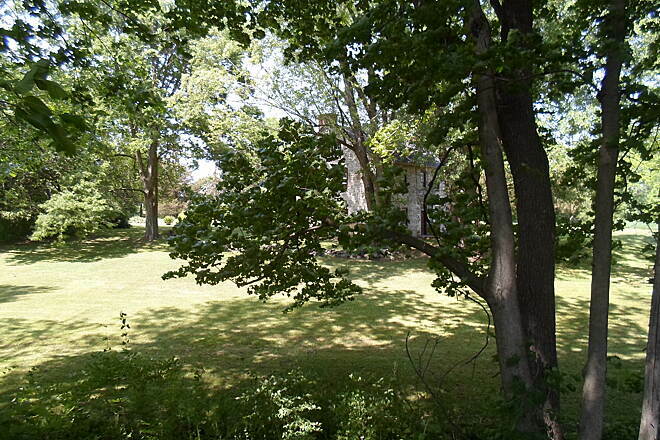 The trail passes these stately homes west of Akron. 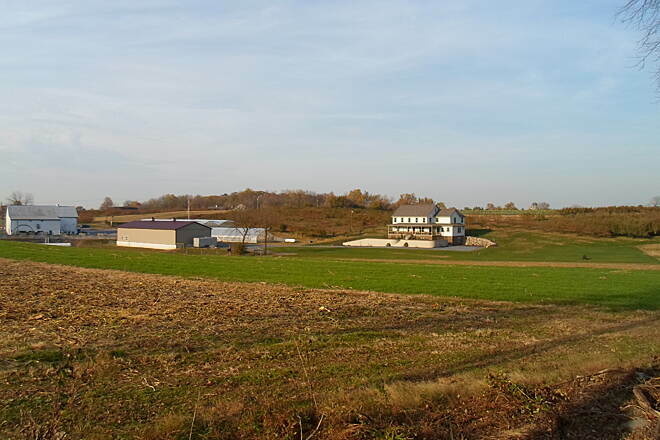 This farm is at the current (as of autumn 2016) western terminus of the Ephrata-Akron segment of the trail at Millway Road. Looking west on the trail from Newport Road. 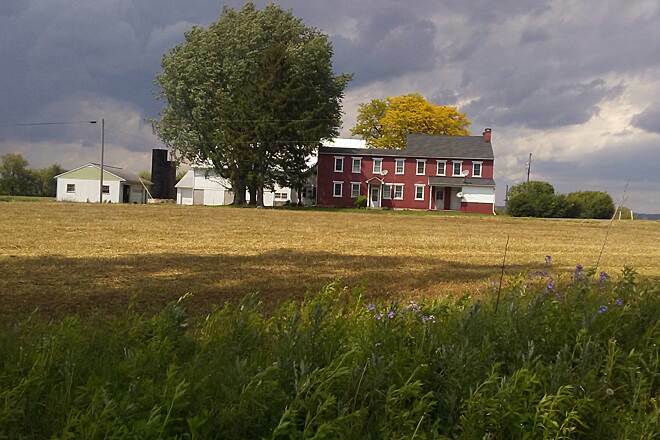 Rural section east of the Warwick Twp. Municipal Campus. 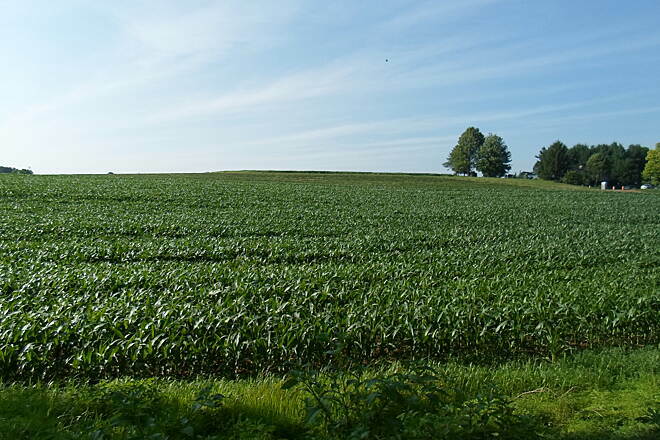 The corn is coming up in this farm field off the trail near Newport Road. Taken June 2016. 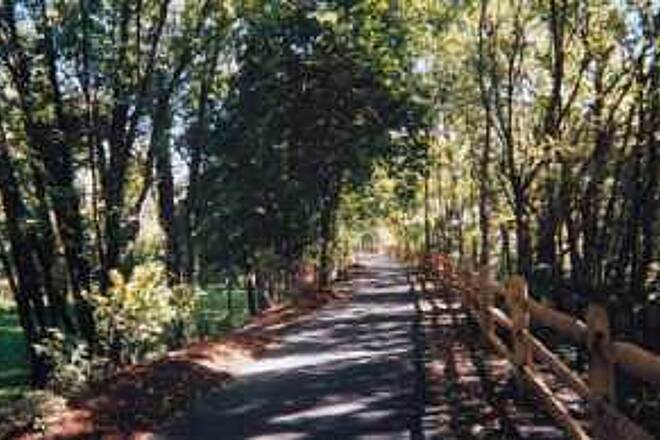 Tree-lined section between the Warwick Twp. Municipal campus and Newport Road. 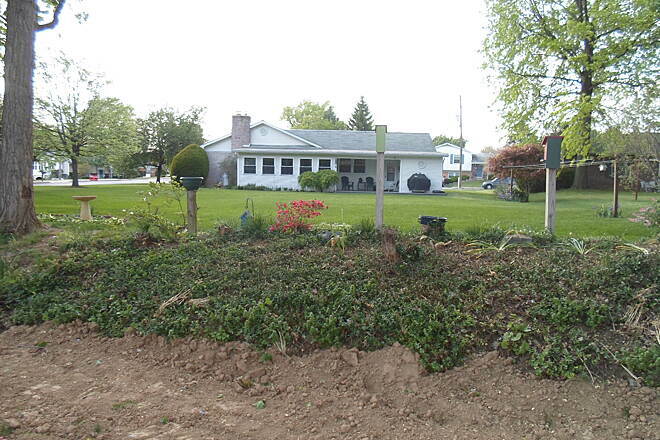 The newest portion in Warwick Twp. 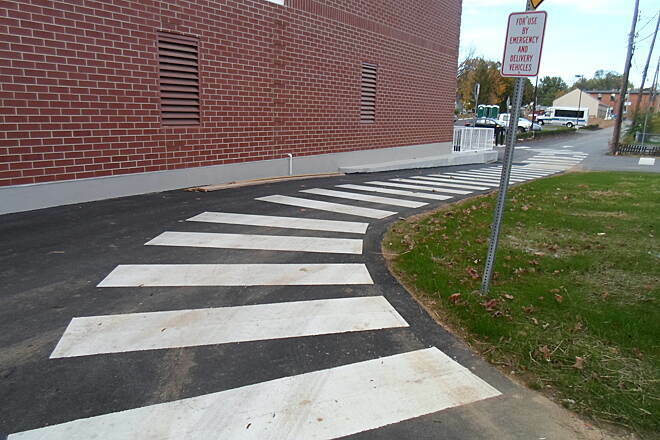 extends alongside the township's public works complex. 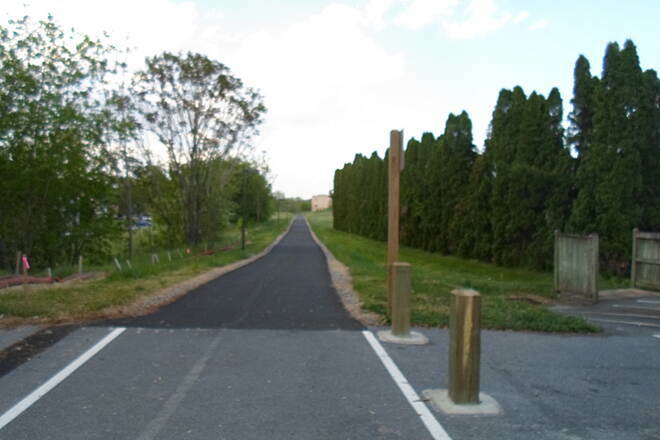 Junction of the newest section of trail and the loop path at the Warwick Twp. Municipal Campus. 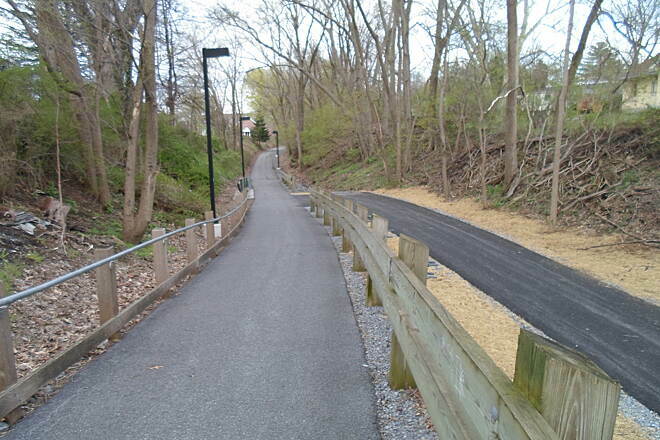 The main trail veers right toward Clay Road, while the left fork follows a more circuitous route around the perimeter of the campus. 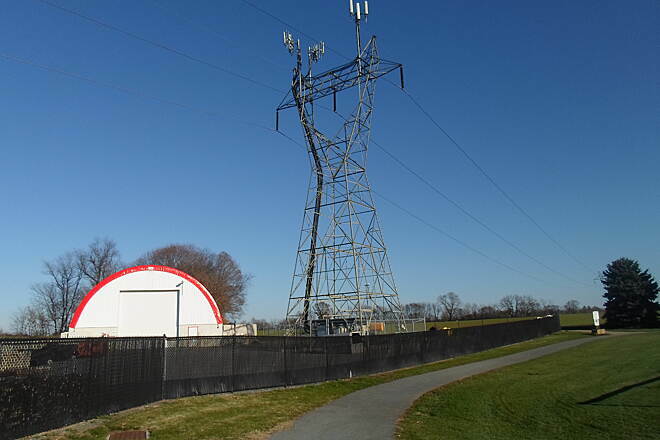 Passing an electrical tower on the north end of the athletic fields at the Warwick Twp. 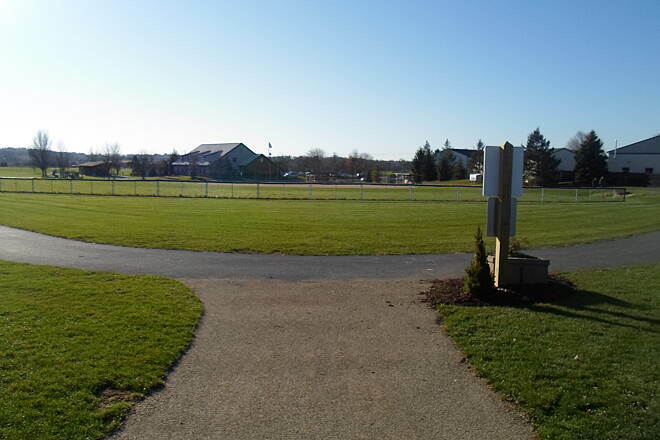 Municipal Campus off Clay Road east of Lititz. 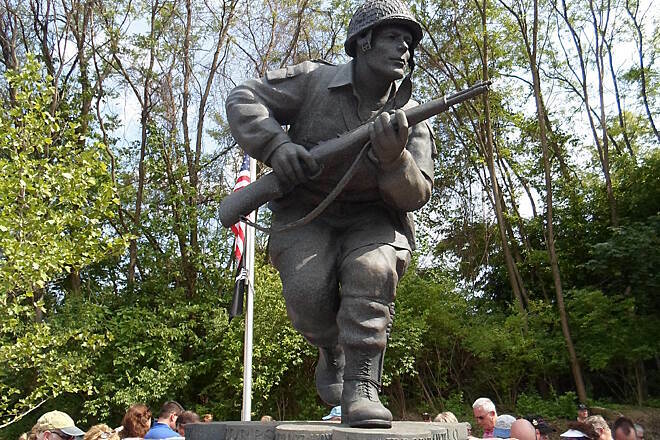 Closeup of the Maj. Richard Winters statue off the Ephrata segment of the trail. Taken May 2015. 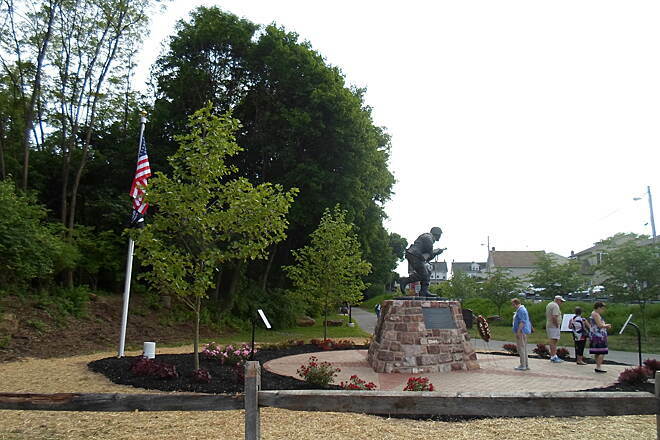 Plaza with the new Major Richard Winters statue off the Ephrata segment of the trail. Taken May 2015. 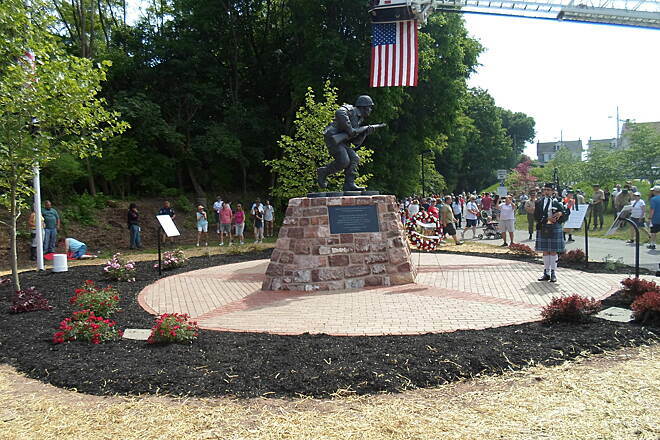 Dedication ceremony for the new statue honoring Maj. Richard Winters, a famous WWII veteran whose service inspired 'Band of Brothers,' on the Ephrata segment of the trail on Memorial Day 2015. Tunnel under Route 272, as seen from the west portal. Taken May 2015. 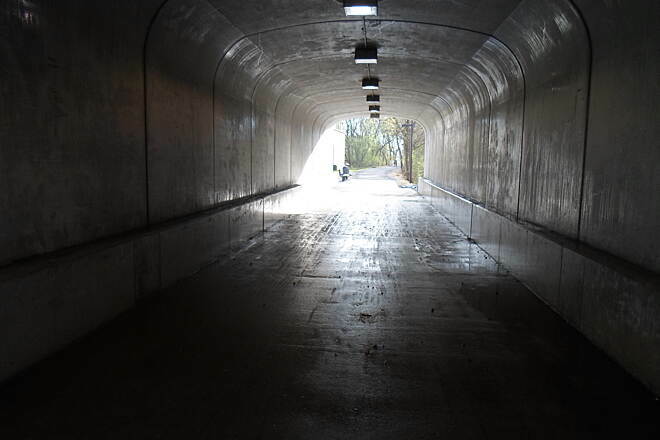 Approaching the tunnel under Route 272 northeast of Akron. 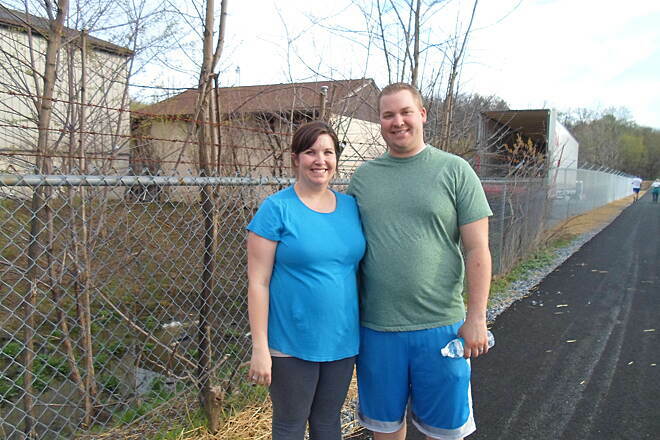 Hikers enjoying the springtime weather. Taken April 2015. 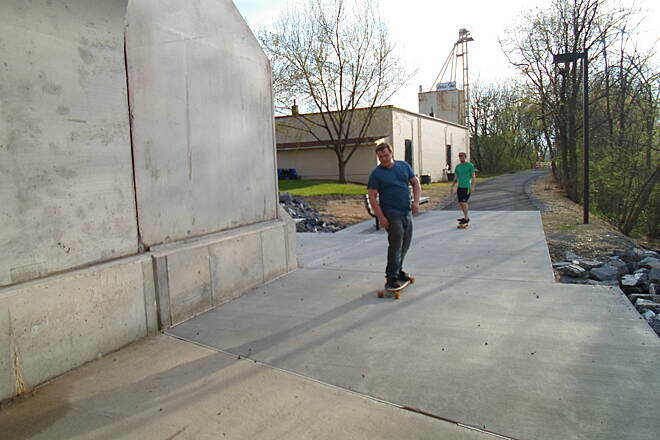 Skateboarding into the tunnel immediately west of Route 272; taken on a warm, spring evening in April 2015. 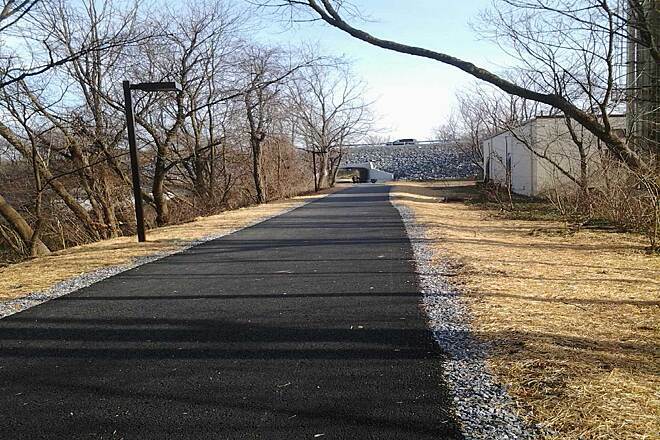 Another photo from the tunnel under Route 272, this time without the eerie light effect. 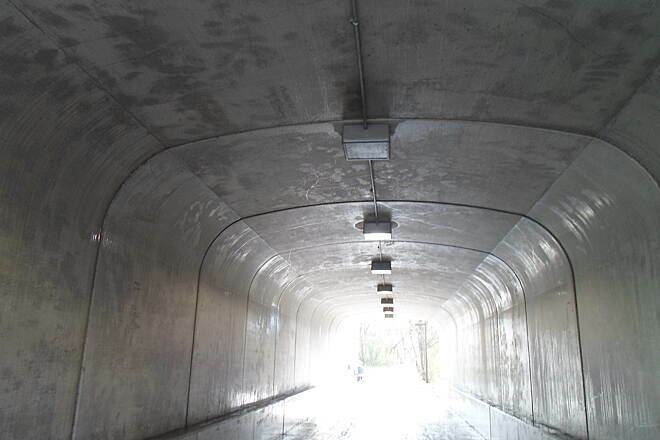 Picture taken inside the tunnel under Route 272; the light creates an otherworldly effect, like something out of a science fiction or horror movie. Taken April 2015. 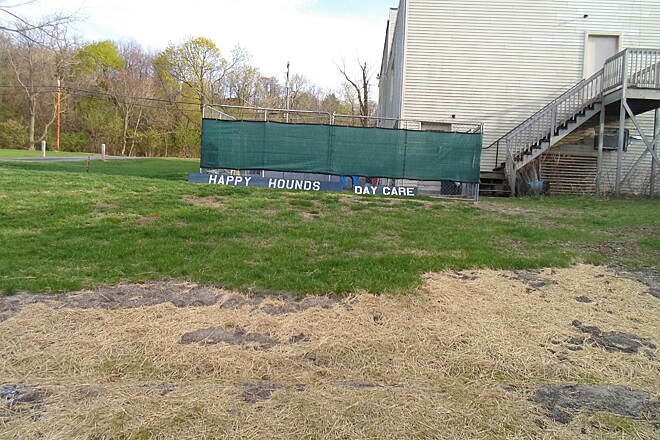 Doggie daycare located off the trail immediately east of the Route 272 tunnel. 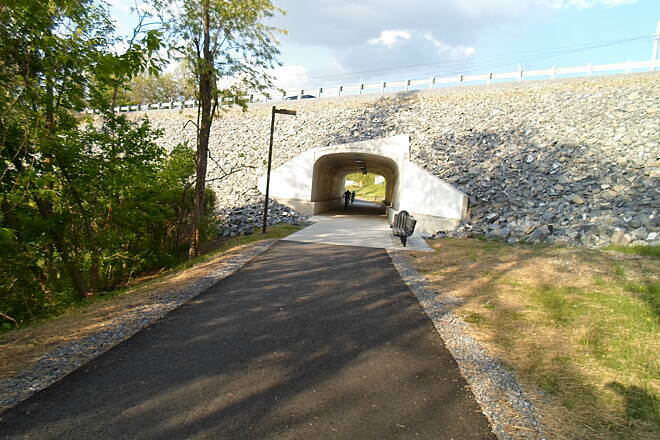 Approaching the tunnel under Route 272 from the east. Taken April 2015. 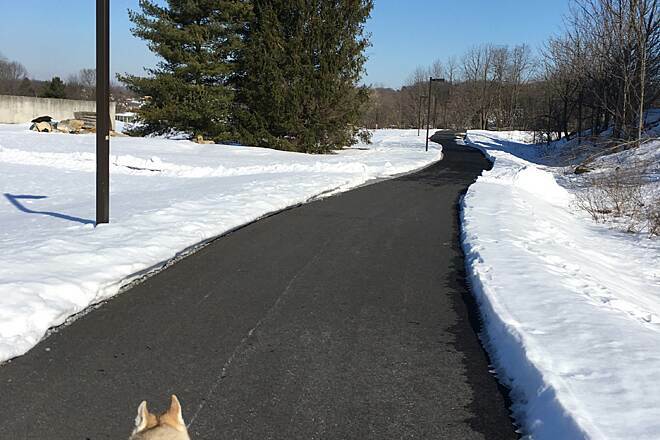 This man was enjoying the trail in Akron with his two dogs. Taken June 2015. 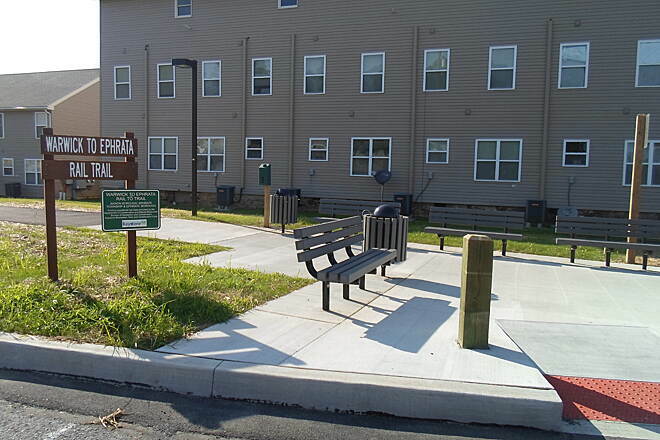 There are only three parking spaces at the Akron trailhead and residents want to further restrict parking on local streets, so it might be best to park in Ephrata. 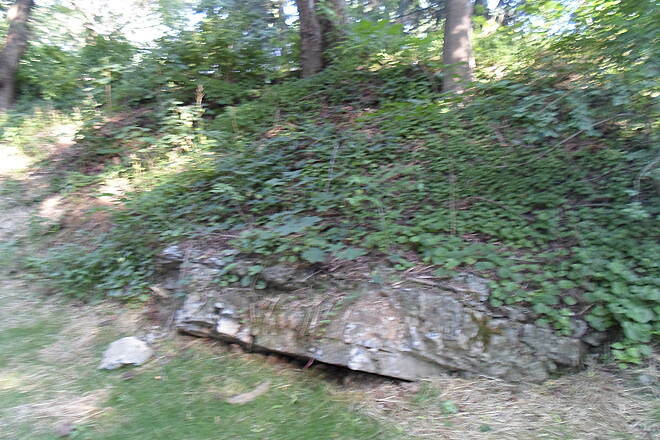 This rock is all that is left of a geological feature that was buried when the ravine that the trail passed through was filled in on either side of Main Street earlier this year. Taken June 2015. 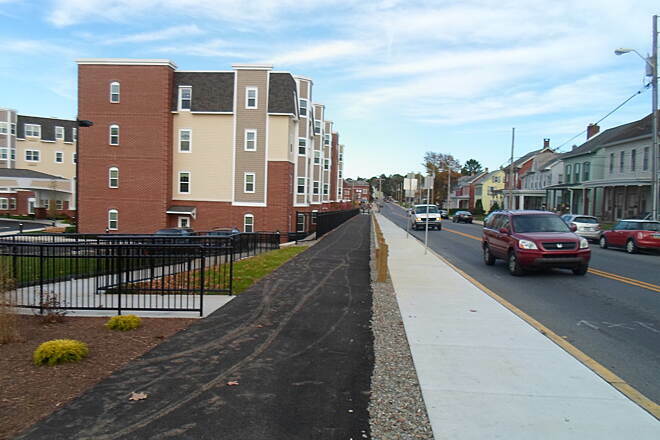 Jogger approaching Main Street on the new section in Akron. Taken June 2015. 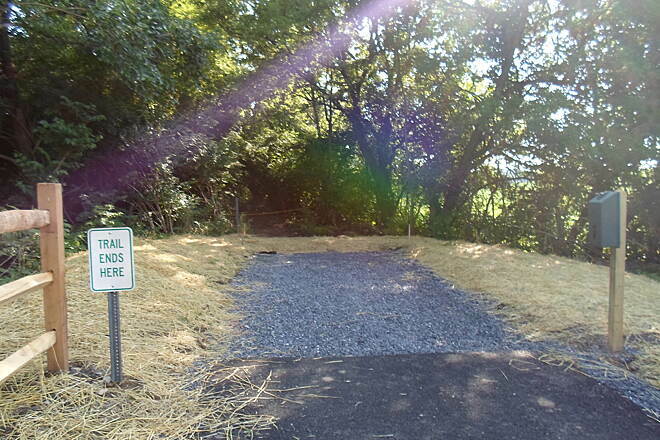 The eastern segment of the trail (as of June 2015) dead ends at the Ephrata Twp. 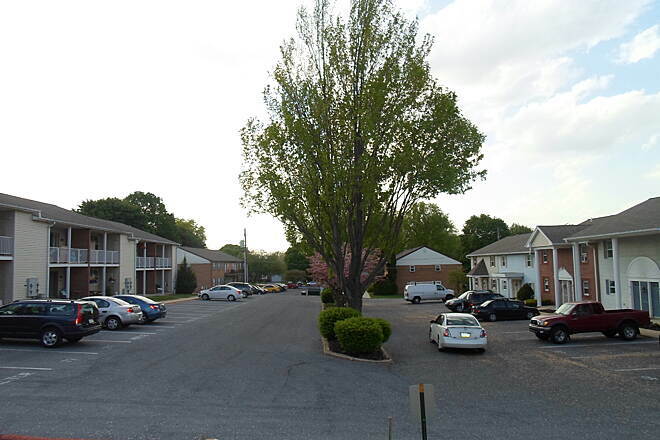 line on Akron's west side. 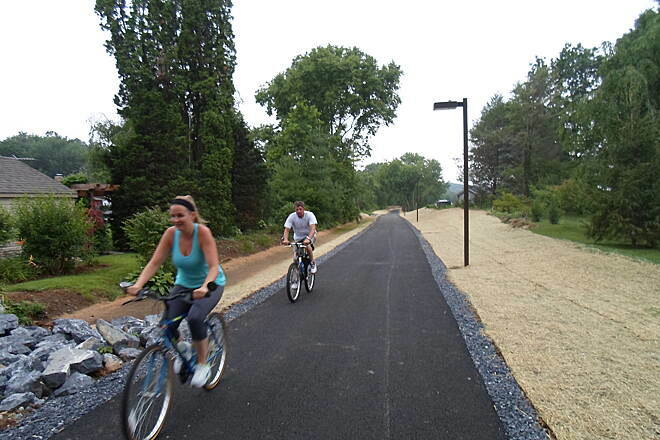 The trail will likely be extended further west to Millport Road in 2016. 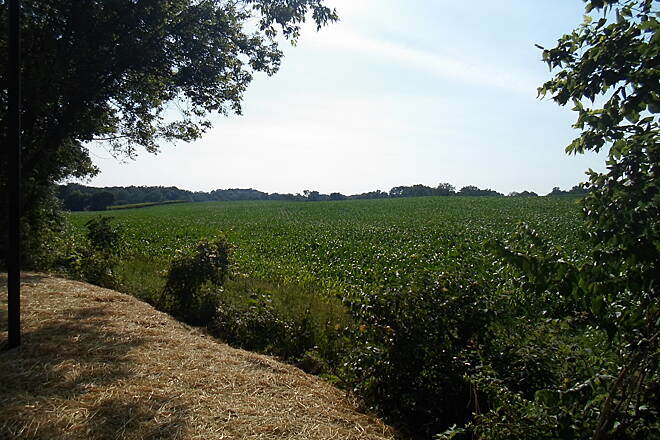 These cornfields create a sea of yellow at the trail's current end at the Akron borough line. Taken June 2015. 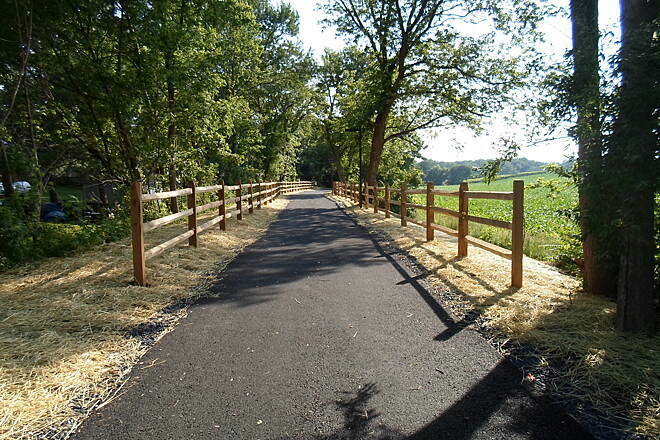 New trail segment on Akron's west end. Taken June 2015. 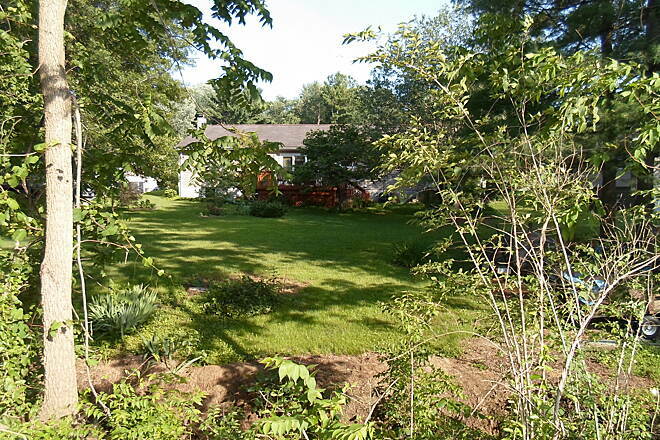 More backyards, as seen from the trail at Akron's west end. Taken June 2015. 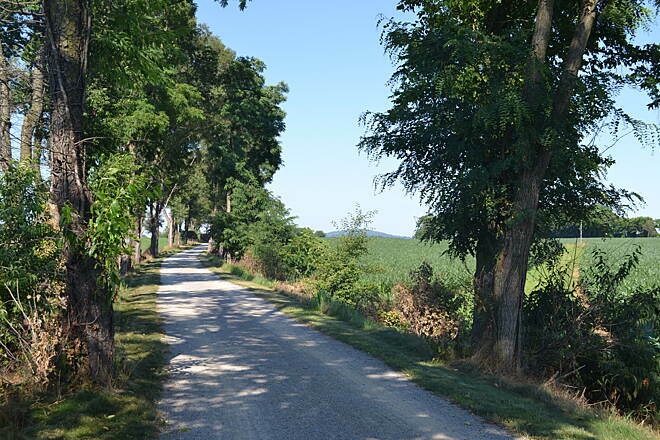 Heading into the countryside on Akron's west end. Taken June 2015. 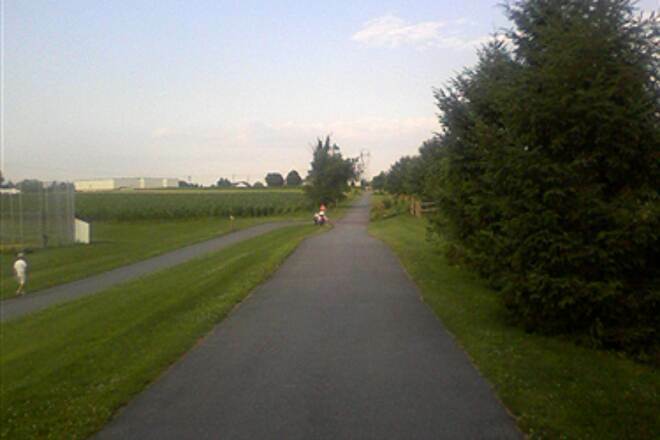 Residential backyards give way to rural cornfields as the trail approaches Ephrata Twp. on Akron's west end. 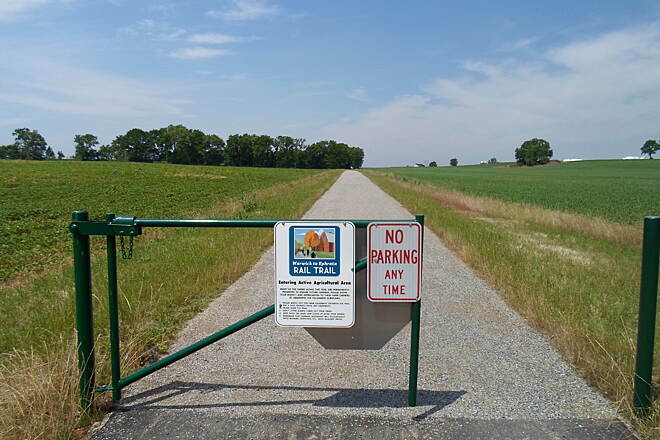 The trail dead ends just west of here, as of June 2015. 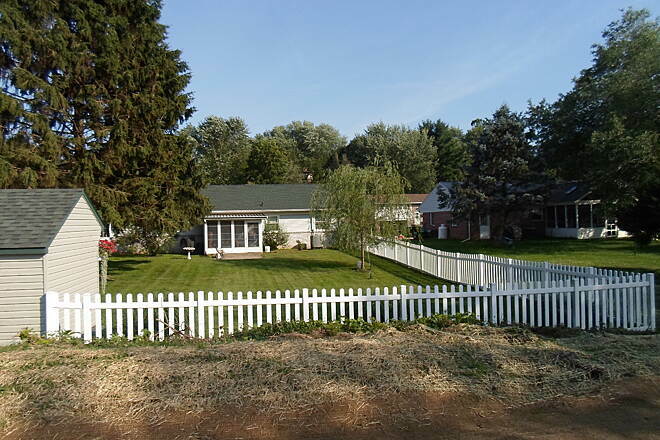 Picket fences and a rail trail on Akron's west end; Norman Rockwell would be proud. Taken June 2015. 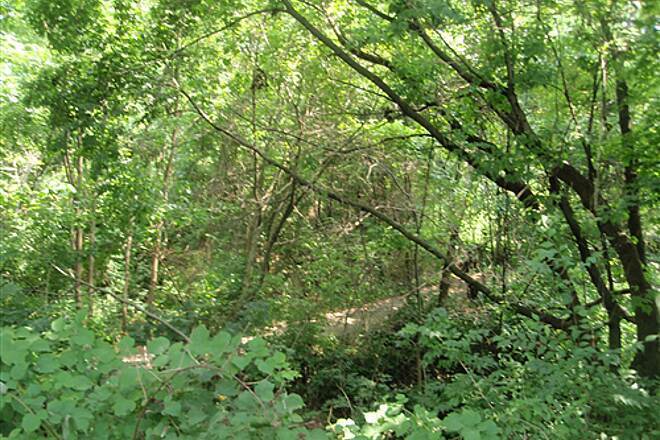 More backyard views from the trail on Akron's west end. 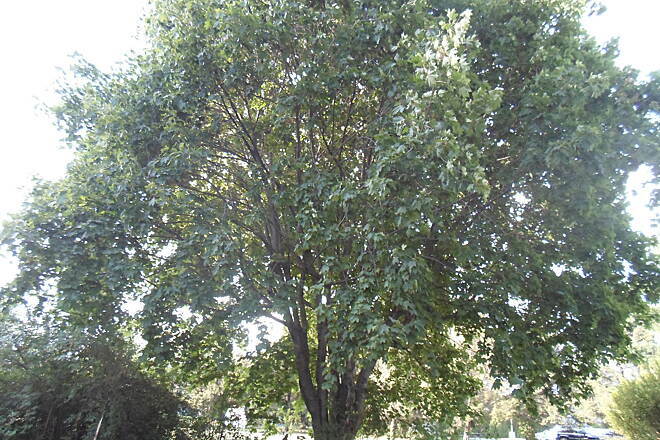 Trees in backyards on Akron's west end. Taken June 2015. 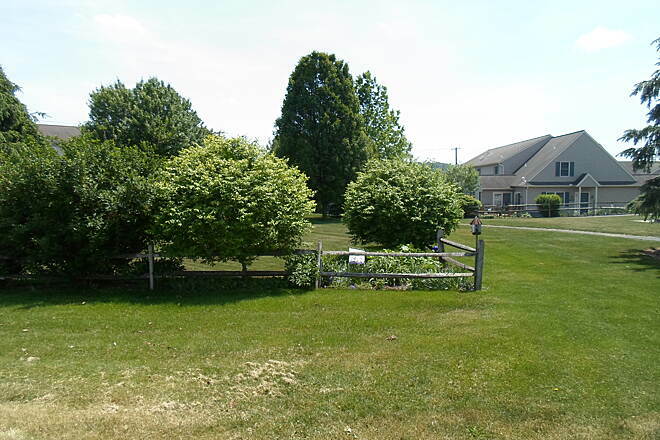 Landscaped yards off the trail on Akron's west side. Taken June 2015. Summer may have just begun, but this family in Akron is already prepared for next winter! Taken June 2015. Heading west toward Akron's west end. Cyclist approaching Main Street in Akron. Taken June 2015. 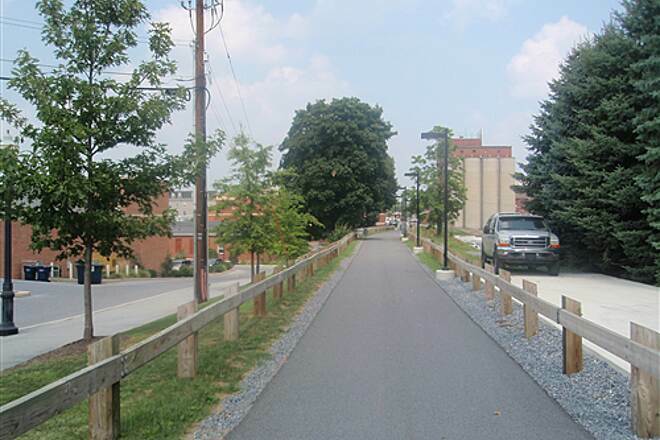 The Akron section of the trail is shaded from Fulton Street west to the borough line, providing cool relief in the warm months of the year. Taken June 2015. 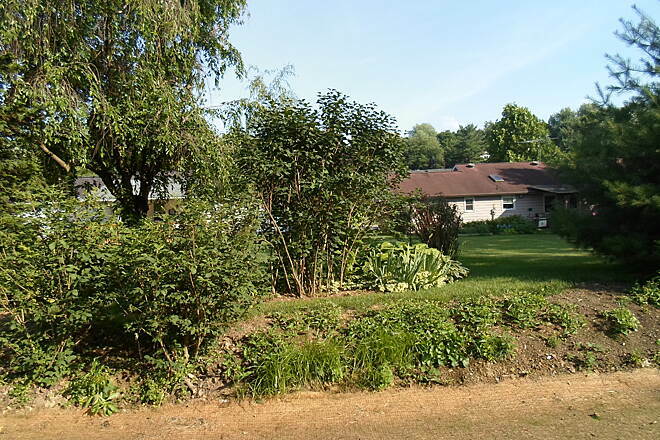 Homes along Front Street, directly across from the Akron trailhead. 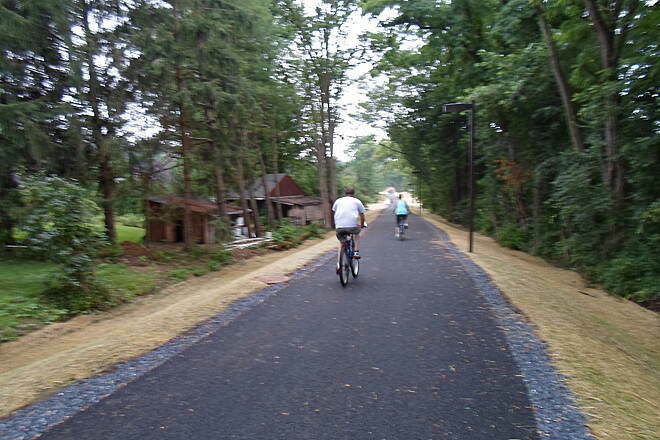 Cyclists on the new segment of trail on Akron's west end. Taken June 2015. 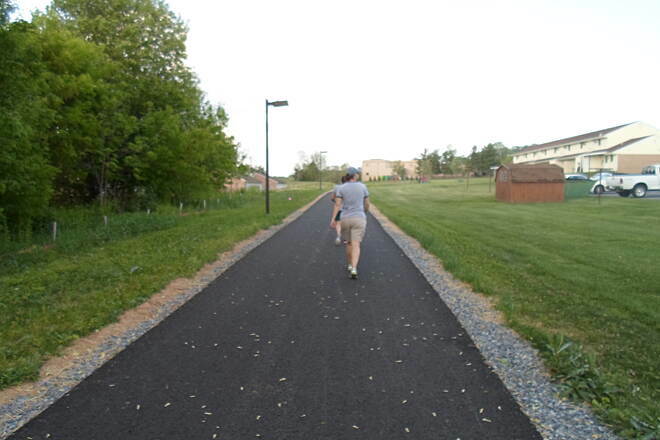 Fellow trail user and photographer on the newest segment of the trail on the west side of Akron. Taken June 2015. 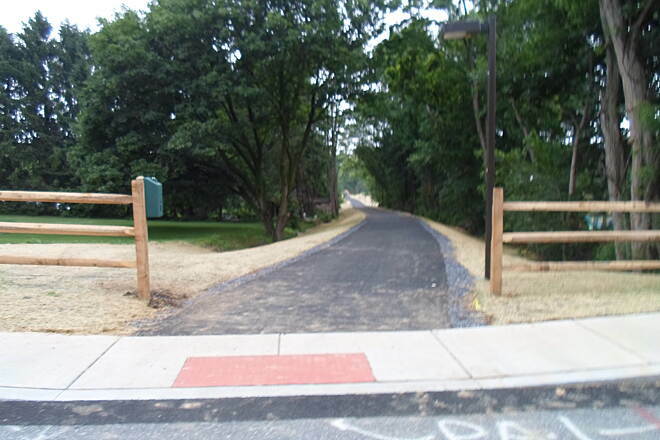 Heading west on the newest (as of June 2015) segment of the trail in Akron. 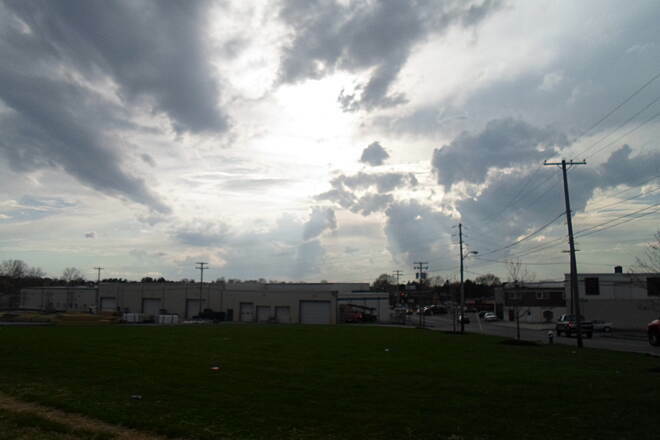 Looking east from the Main Street crossing in Akron. 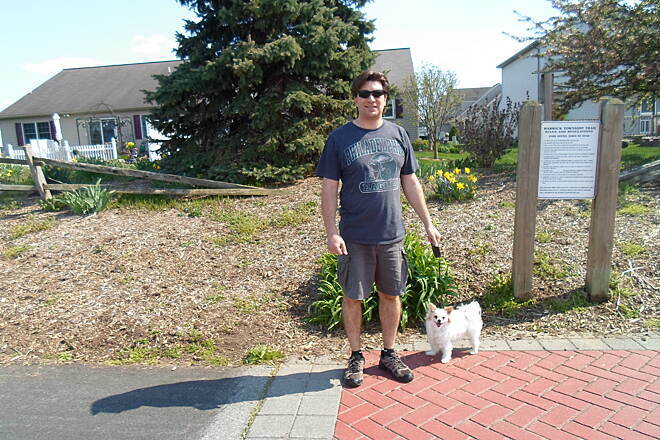 The fencing and dog poop bag dispenser are new features. Taken June 2015. 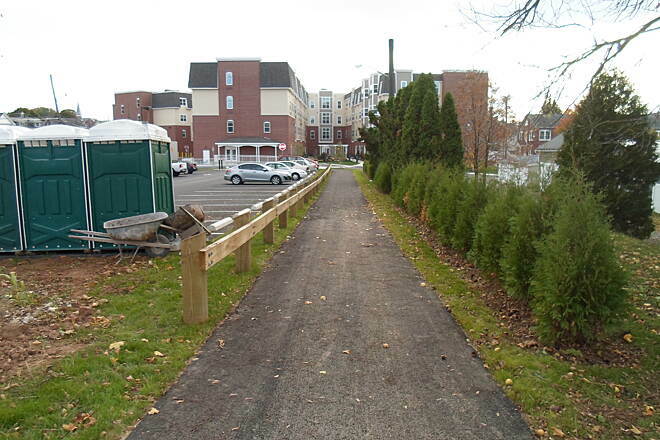 The crossing at Main Street in Akron is now landscaped, with wooden fencing and a dog poop bag dispenser. 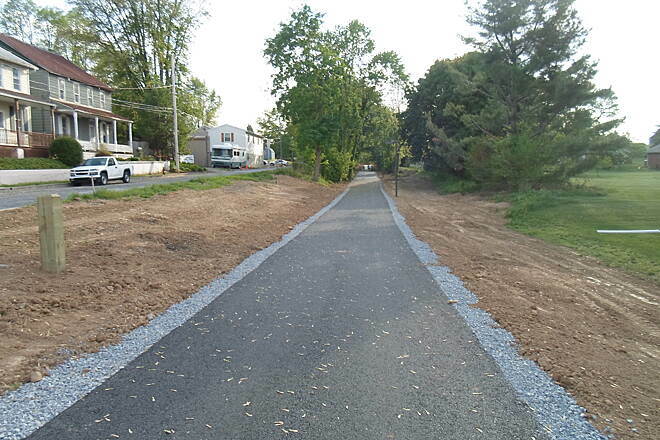 The segment of the trail from here to the western boundary of town is also complete. Taken June 2015. 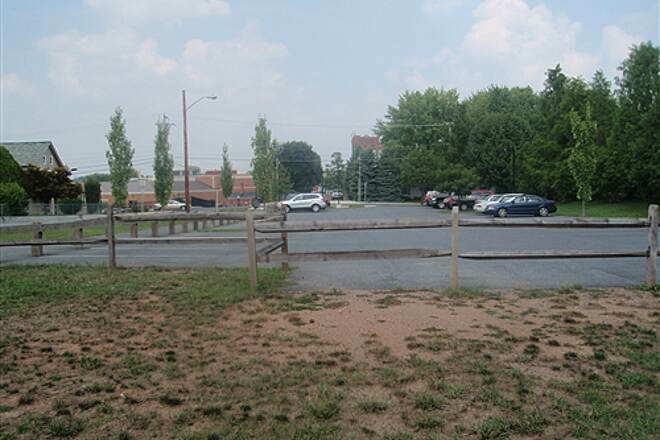 Looking west from the Akron trailhead toward Main Street and the west end of town. Taken June 2015. 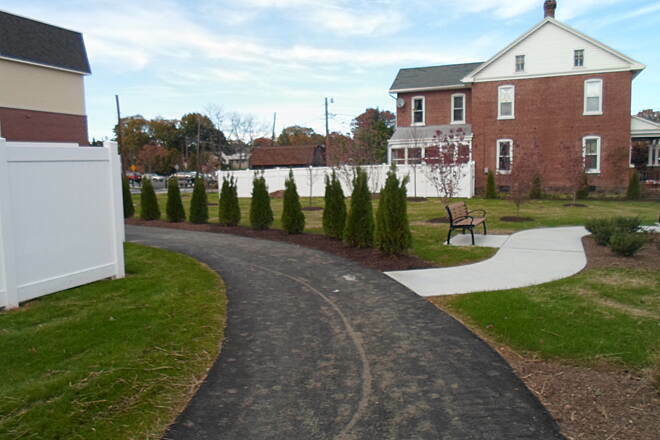 Small plaza at the trailhead in Akron on the corner of Fulton and Front streets. Taken June 2015. 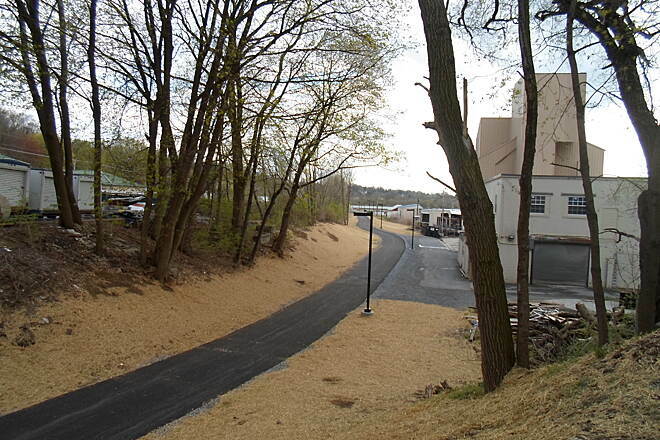 Another view of the completed Akron trailhead. Taken June 2015. 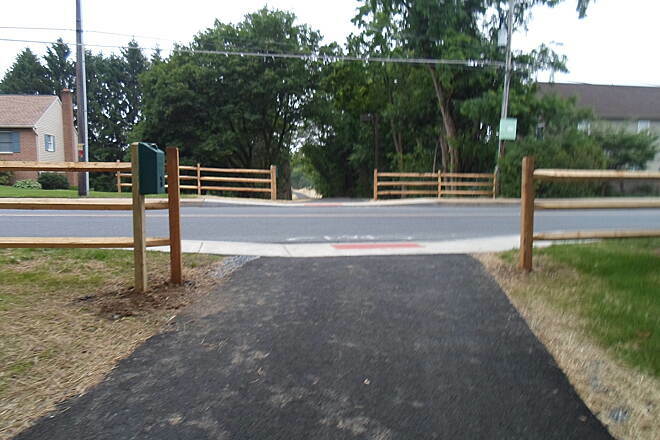 Akron trailhead at the corner of Fulton and Front streets, now complete. Taken June 2015. 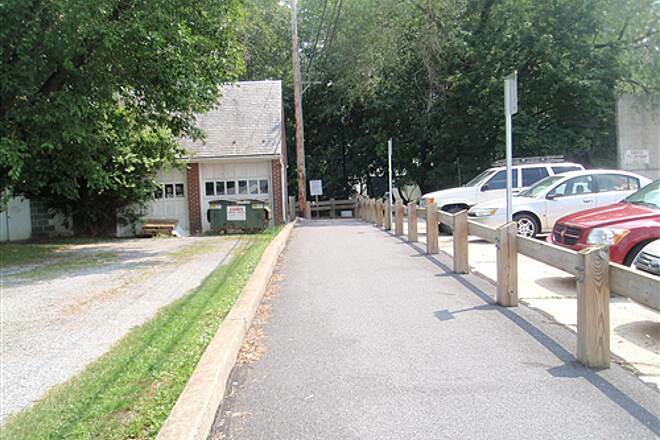 Restored RR bridge on the Lititz-Warwick Trailway east of Lititz. Taken May 2015. 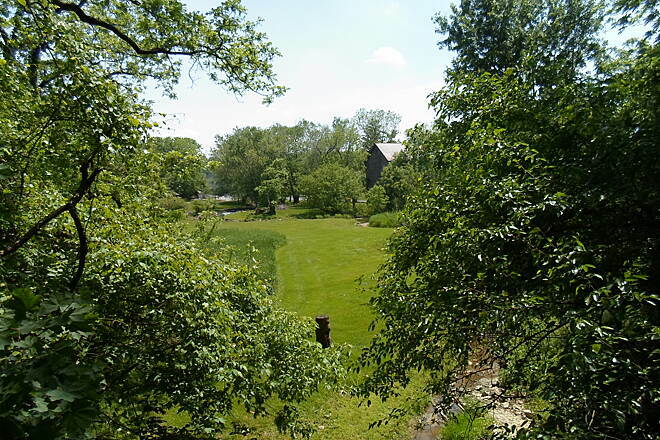 View of the Hess house from the Lititz-Warwick Trailway in spring. 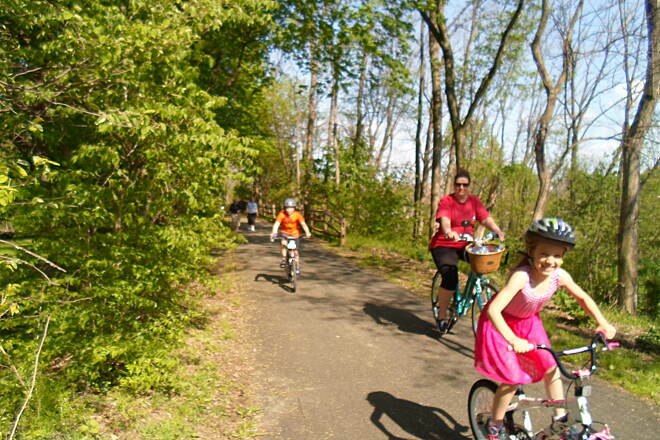 This family came cycling by during a springtime hike on the Lititz-Warwick Trailway in May 2015. 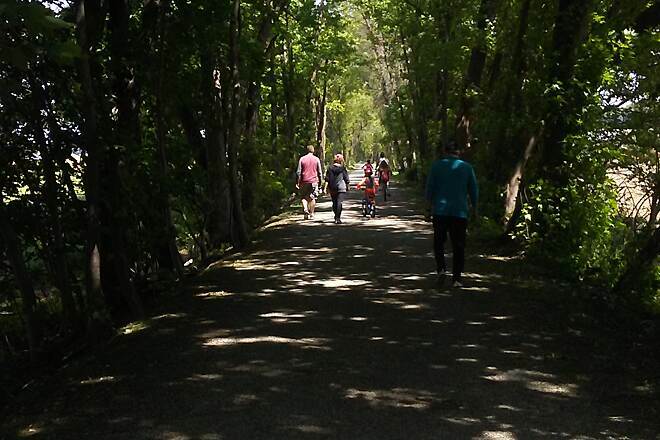 Cyclists on the Newport Branch section in the spring 2015. 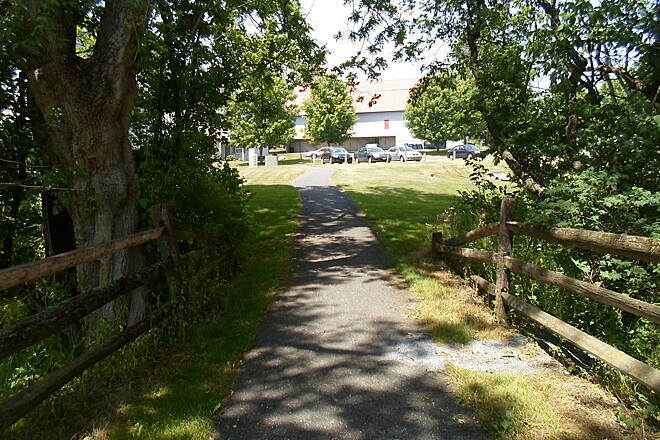 Access path that connects the Newport Square branch to John Bonfield Elmentary School northeast of Lititz. 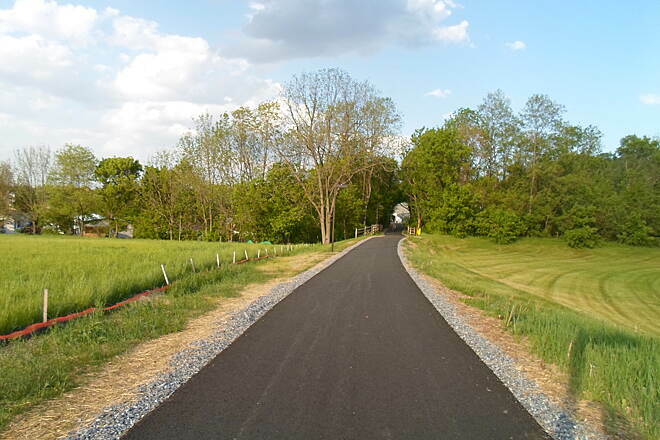 Approaching Clay Road on the Lititz-Warwick Trailway. Taken May 2015. Springtime blooms. Taken May 2015. 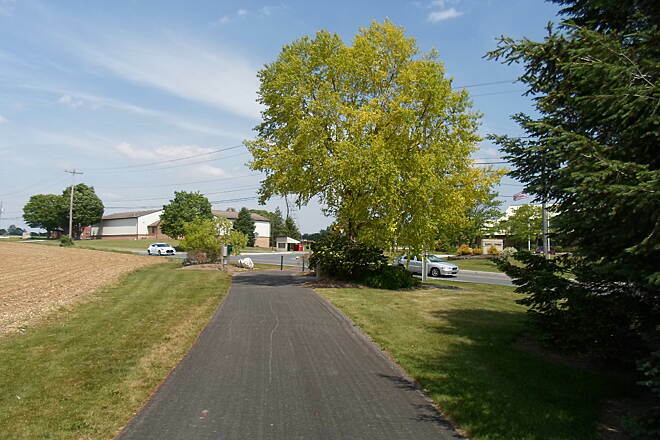 The Newport Square branch rounds this bend, then slightly ascends to the junction with the main path of the Lititz-Warwick Trailway. 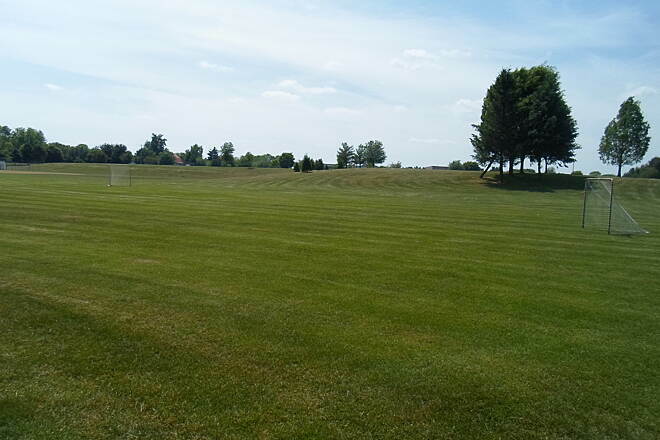 Passing more athletic fields east of the Newport Square branch in Warwick Twp. Taken May 2015. 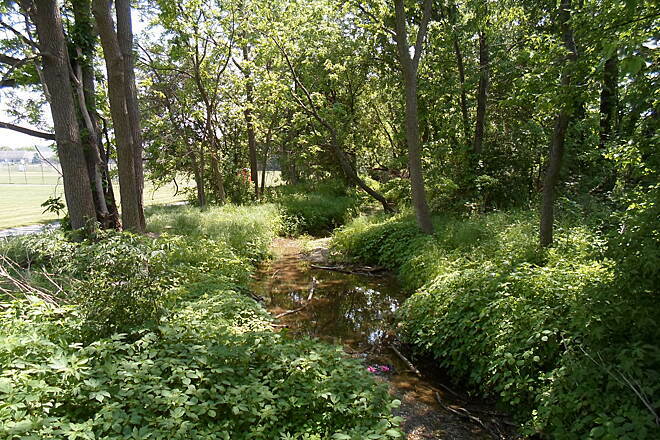 The Newport Square section of the trail follows this stream northeast of Lititz. Taken May 2015. 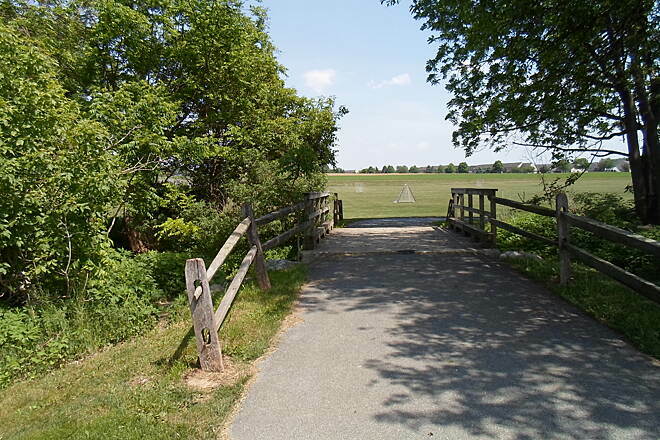 Crossing a small stream on the Newport Square branch northeast of Lititz. 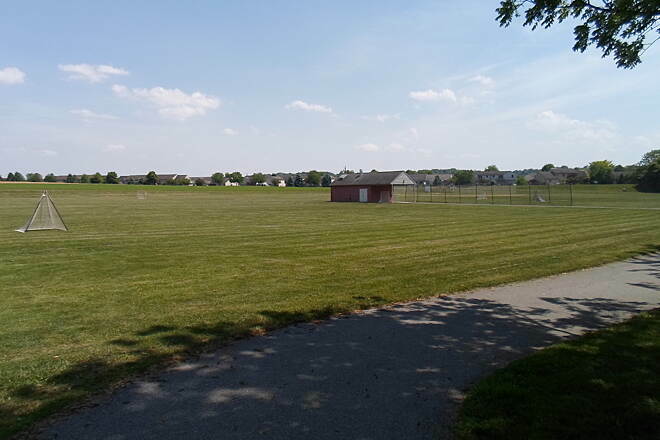 Athletic fields behind John Bonfield Elementary School, visible from the Newport Square branch trail northeast of Lititz. Taken May 2015. 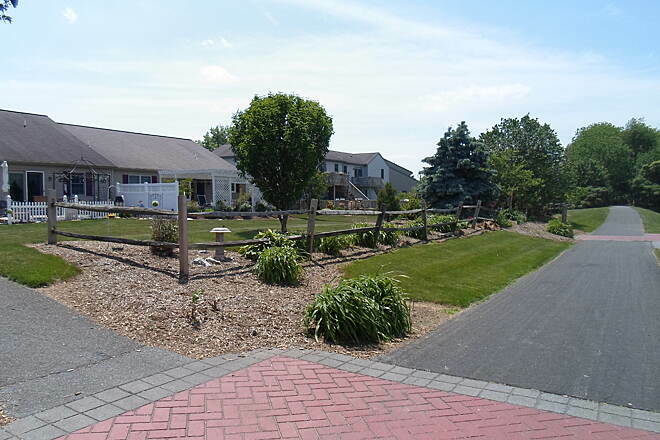 More landscaped yards along the Newport Square branch of the trail in Warwick Twp. 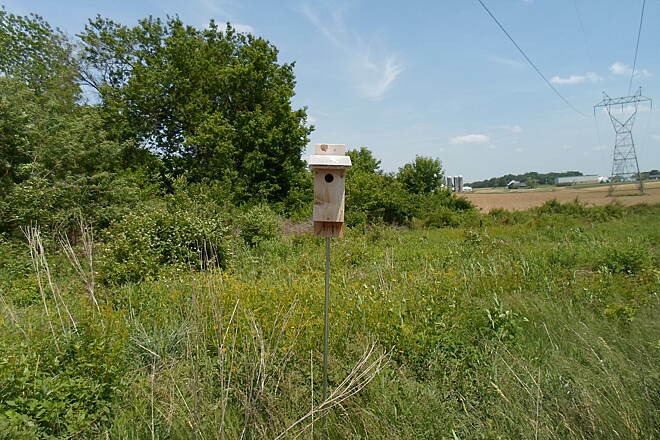 Birdhouse along the Newport Square branch of the Lititz-Warwick Trailway. Taken May 2015. 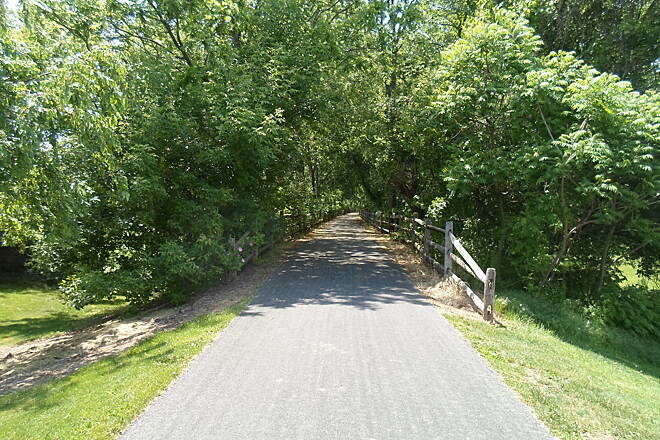 Junction between the branch path and the Newport Square portion of the Lititz-Warwick Trailway on a sunny spring day. Taken May 2015. 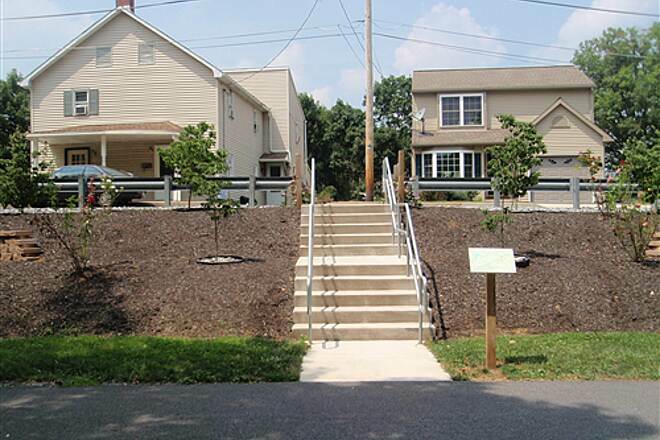 Landscaping along the branch path that connects Oak Street to the Newport Square portion of the trail northeast of Lititz. Taken May 2015. 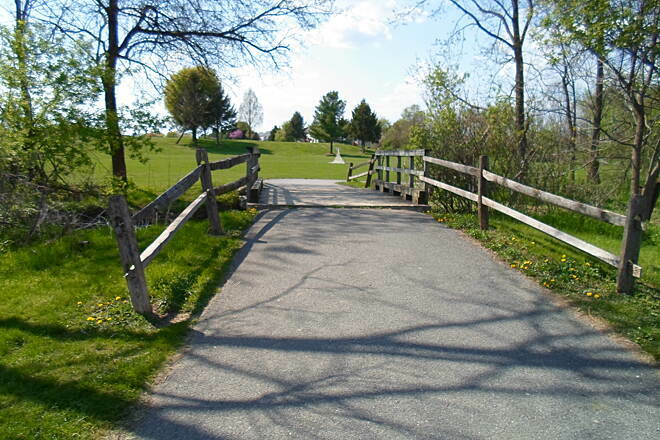 A branch path that connects the Newport Square section to Oak Street in Warwick Twp. follows a powerline corridor. Taken May 2015. 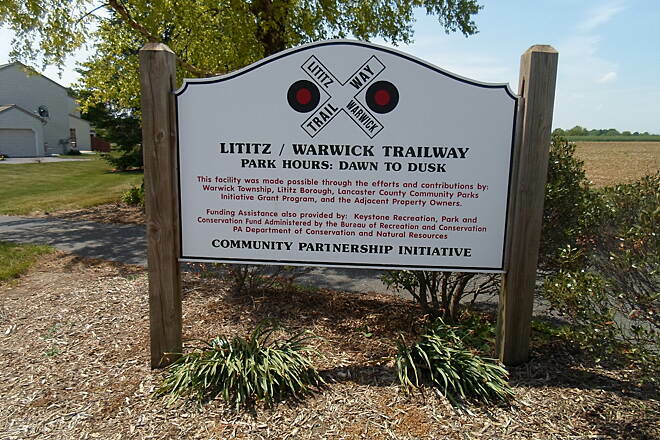 Sign at the current, western terminus of the Lititz-Warwick Trailway section off Oak Street in Lititz. Taken May 2015. 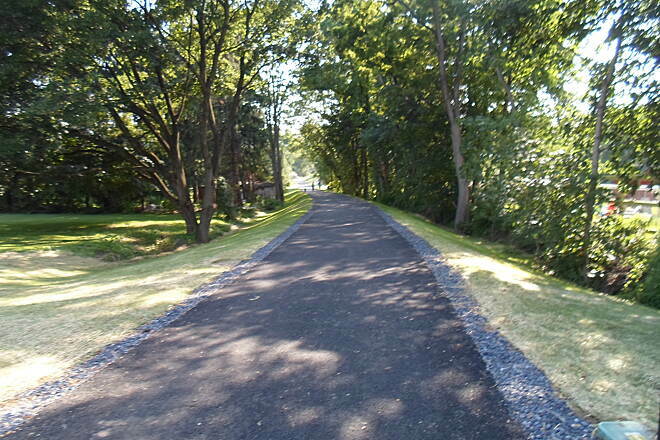 Looking east along the Lititz-Warwick Trailway from Oak Street on the borough's east end. Taken May 2015. 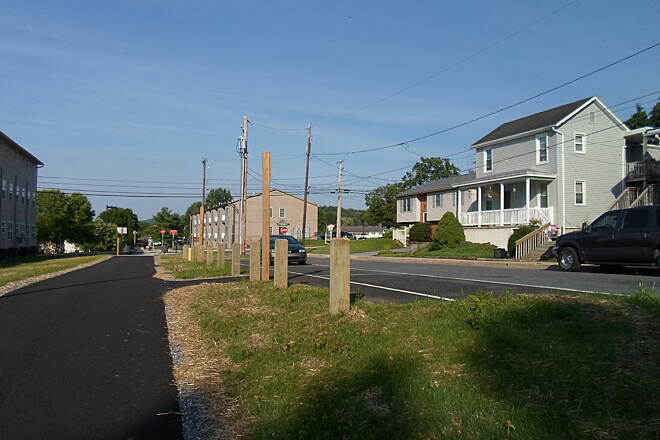 Oak Street, on the east end of Lititz, is the western terminus of the Lititz-Warwick Trailway section, as of 2015. 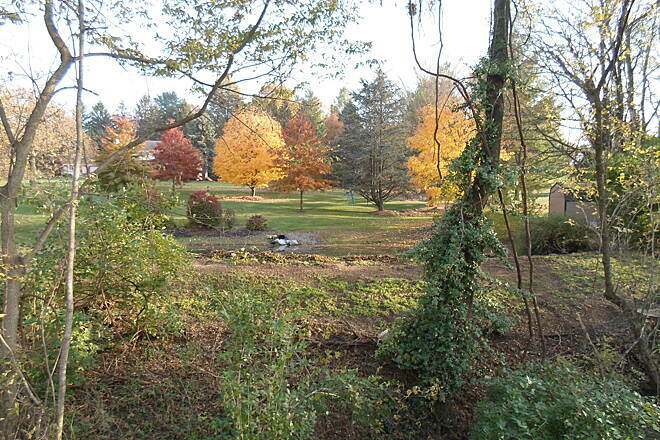 However, plans call for it to be extended into the borough in the next couple years, ending at Lititz Springs Park. 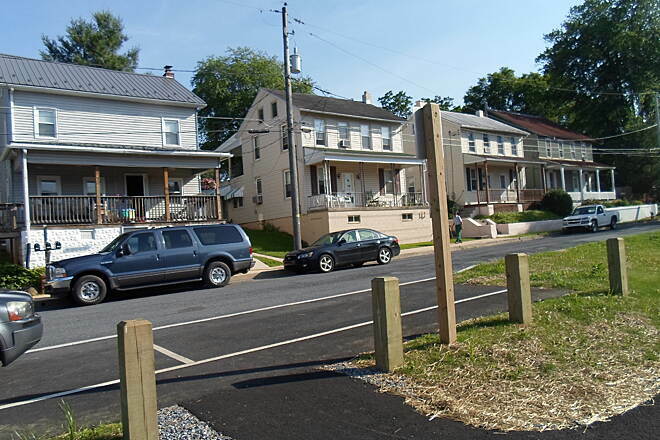 Approaching Oak Street on the east end of Lititz. 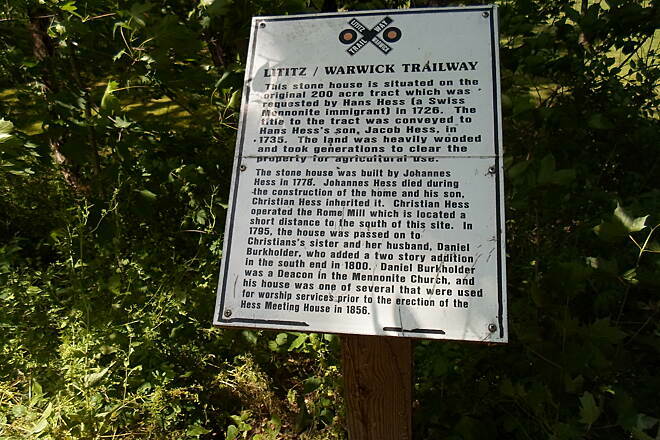 Passing through the woods east of Lititz. Taken May 2015. 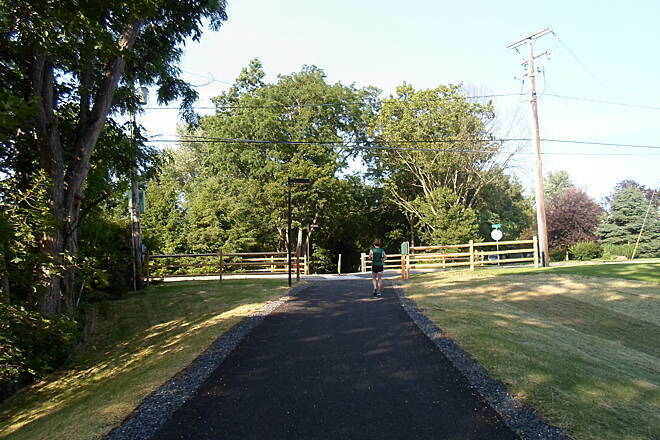 Access path that connects the Lititz-Warwick Trailway to a condo complex east of Lititz. 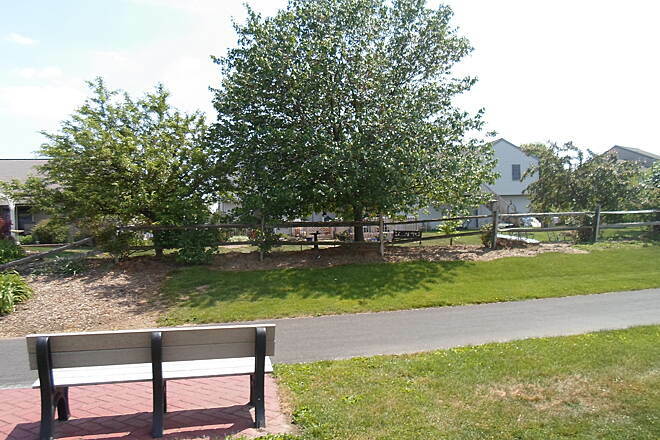 Bench and trash can along the Lititz-Warwick Trailway. 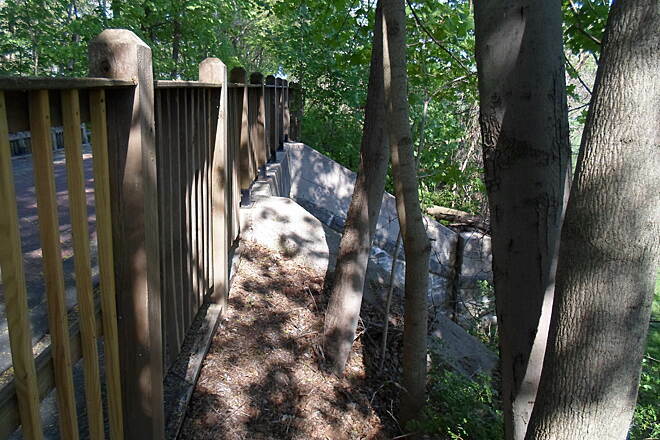 Situated in the woods, this gives trail users a cool place to rest in the warm months of the year. 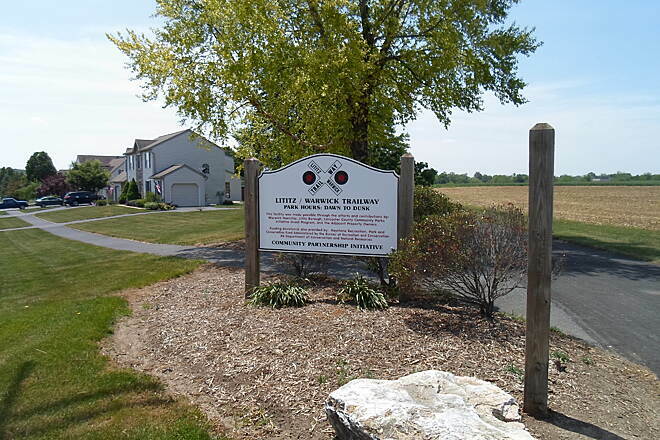 Sign interpreting the history of the Hess house just east of Lititz. Taken May 2015. 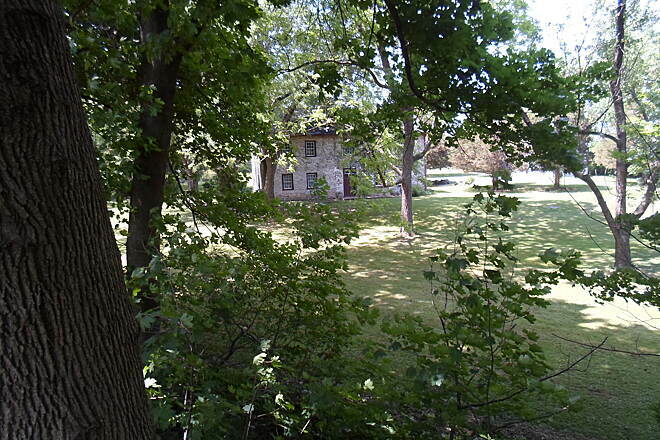 Hess house, seen through the trees. Taken May 2015. 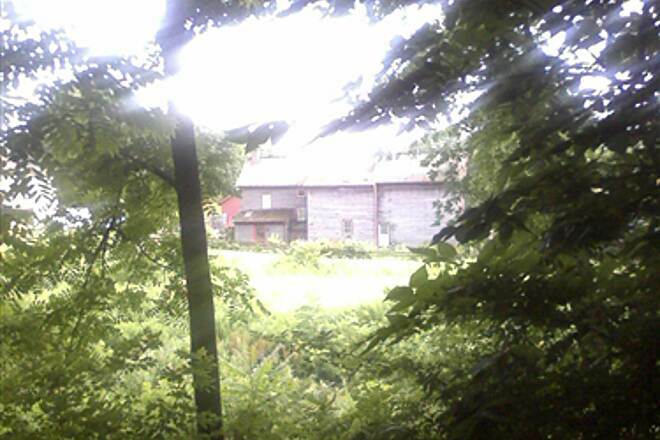 Another view of the historic Hess home, as seen from the Lititz-Warwick Trailway. Taken May 2015. 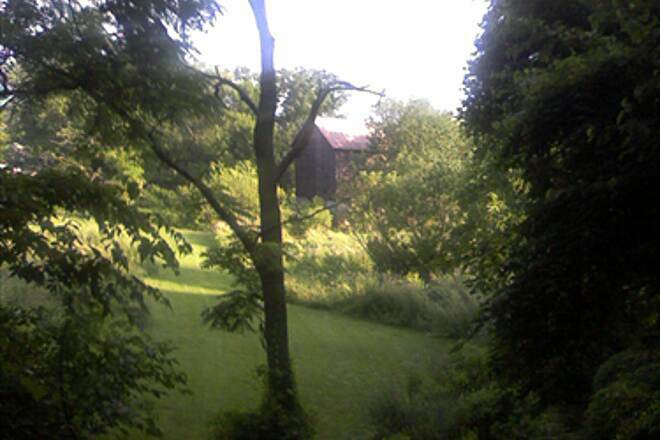 Looking south towards the old mill east of Lititz. 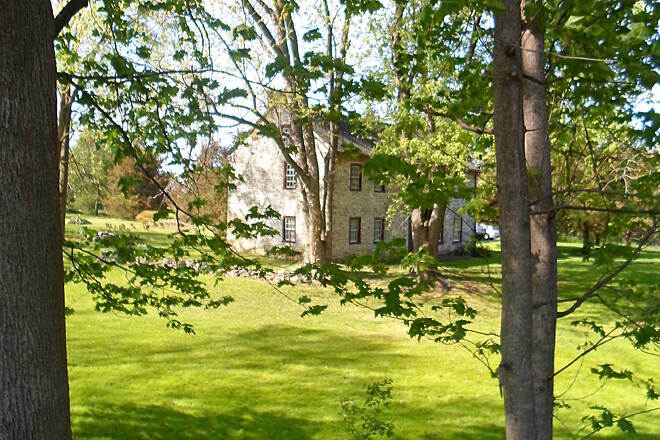 Hess stone house, one of two historical buildings visible from the Lititz-Warwick Trailway east of Lititz. Taken May 2015. 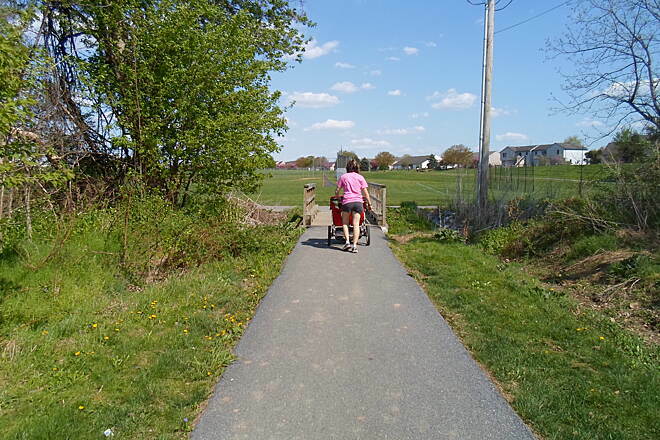 Mom and her baby enjoying a sunny, spring day on the branch trail that connects to John Bonfield Elementary School east of Lititz. Taken May 2015. 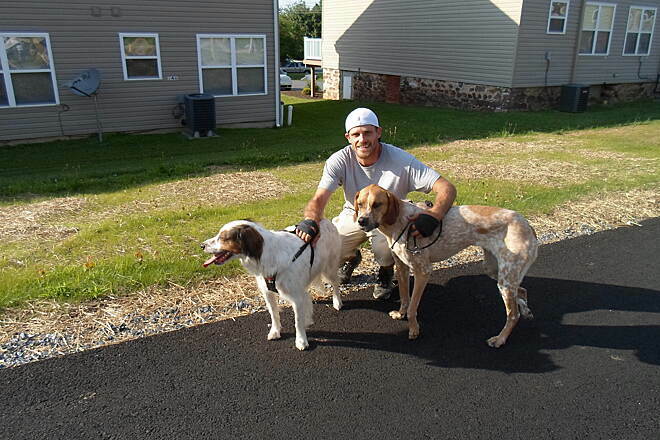 Man and his dog at the junction of the Warwick-Ephrata and Newport Square trails. Taken May 2015. 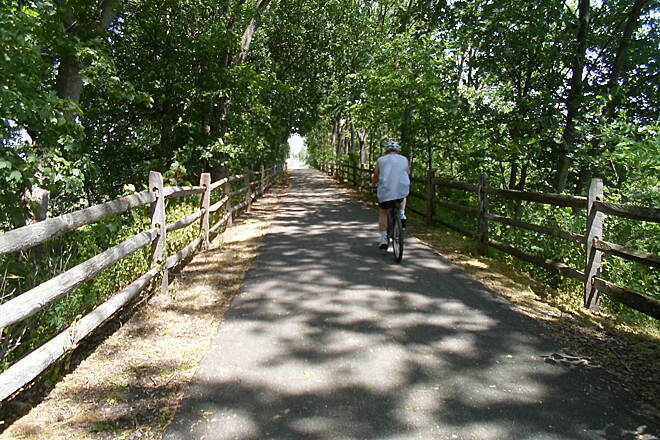 Cyclist riding through the wooded section of the Lititz-Warwick Trailway east of Lititz. 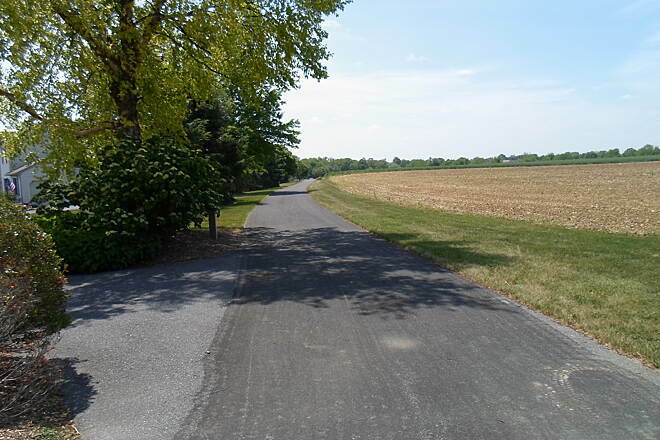 View south from the Lititz-Warwick Trailway east of Oak Street near Lititz. 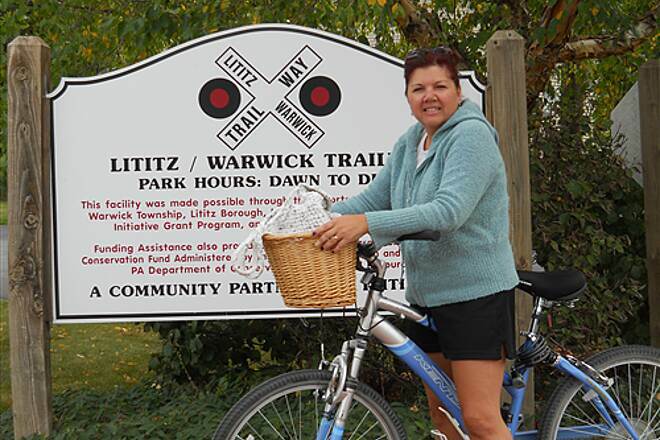 Entering the woods on the Lititz-Warwick Trailway. 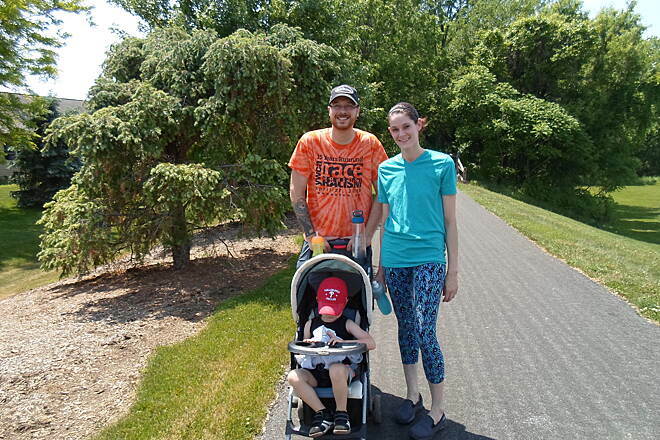 Family enjoying a Memorial Day stroll on the Lititz-Warwick Trailway. Taken May 2015. 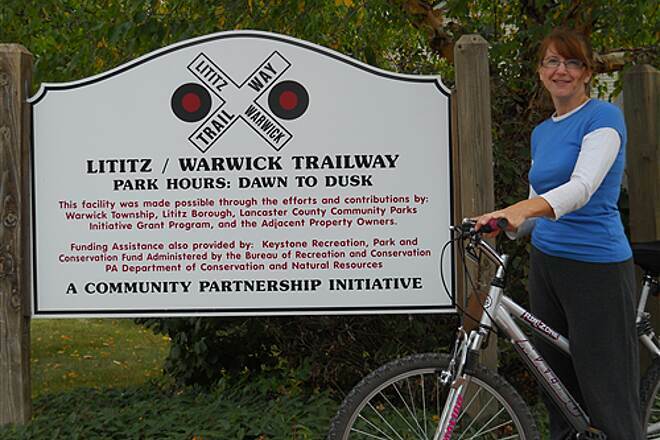 Landscaped gardens and yards decorate the junction of the Lititz-Warwick Trailway and Newport Branch Trail east of Lititz. 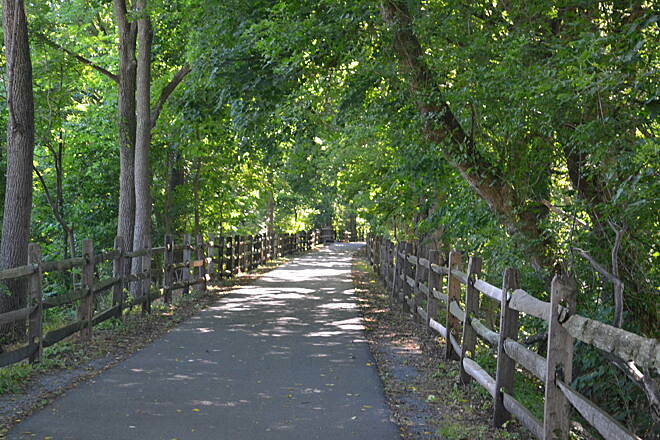 Junction between the main alignment of the Lititz-Warwick Trailway, which continues straight into the woods, and the Newport Branch Trail, which veers right and heads north toward Newport Road. Taken May 2015. 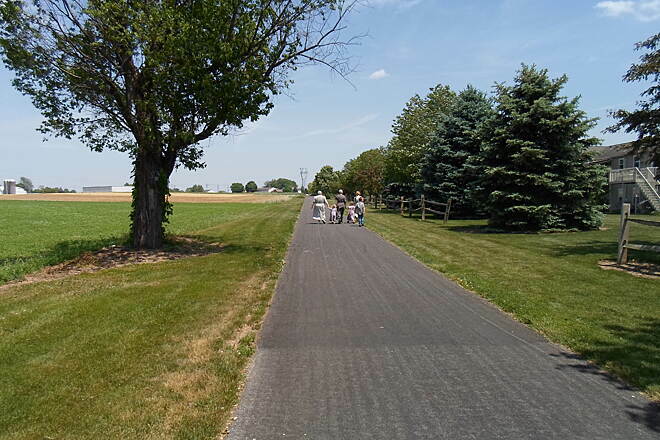 Plain women and their kids enjoying a Memorial Day stroll on the Lititz-Warwick Trailway portion of the trail east of Lititz. Taken May 2015. 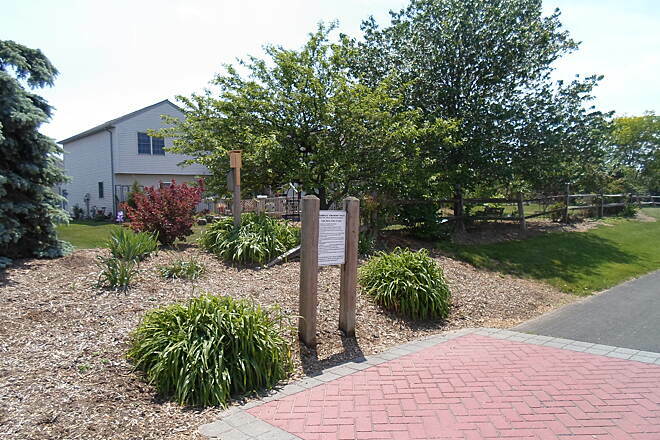 More landscaped gardens along the Lititz-Warwick Trailway section of the trail. Taken May 2015. 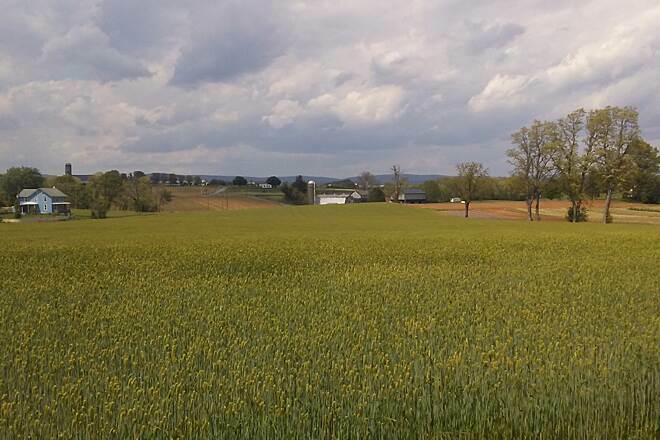 Looking east toward Clay Road and the Warwick Twp. 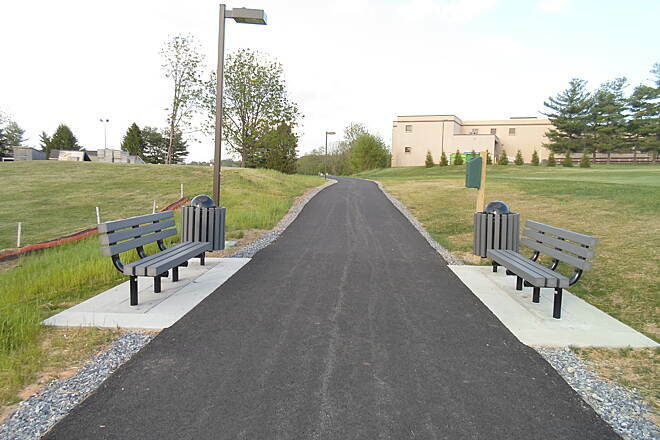 Municipal Campus on the completed, western section of the greenway. Taken May 2015. 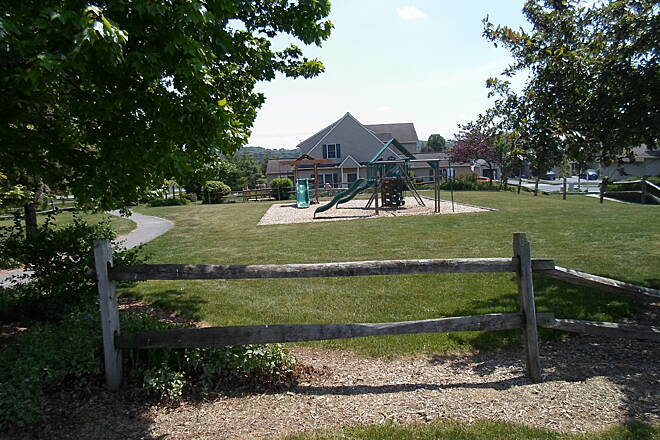 This playground was off the trail in a subdivision off Clay Road, further contributing to the 'greenbelt' effect. Taken May 2015. 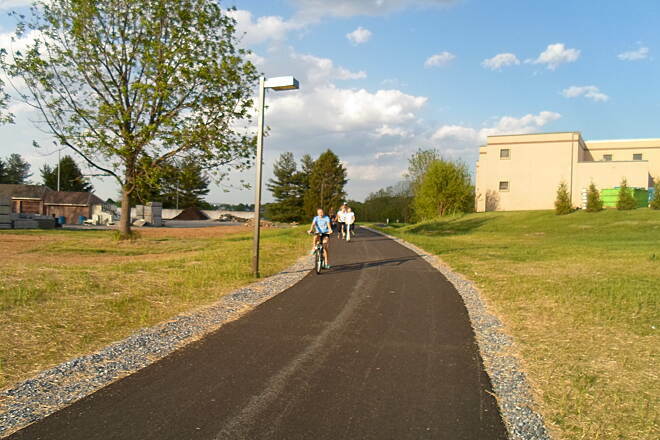 Access path from the Lititz-Warwick Trailway to a Warwick Twp. subdivision. 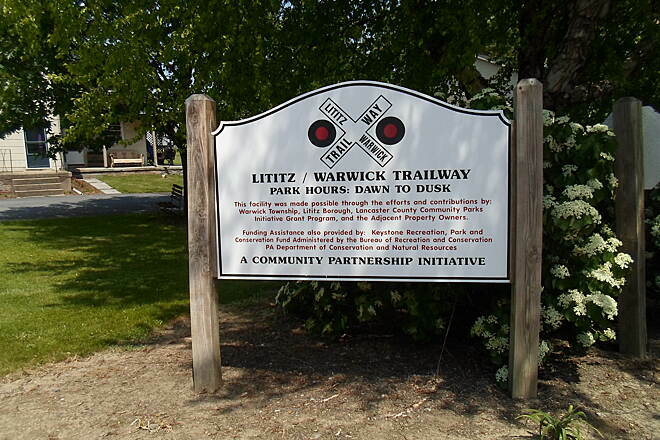 Signage showing maps of the Lititz-Warwick Trailway and a branch trail make the western, completed segment very user-friendly. 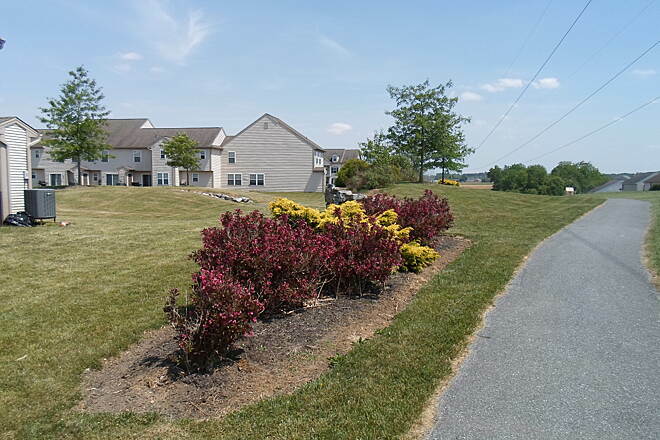 Passing behind developments west of Clay Road in Warwick Township. Taken May 2015. 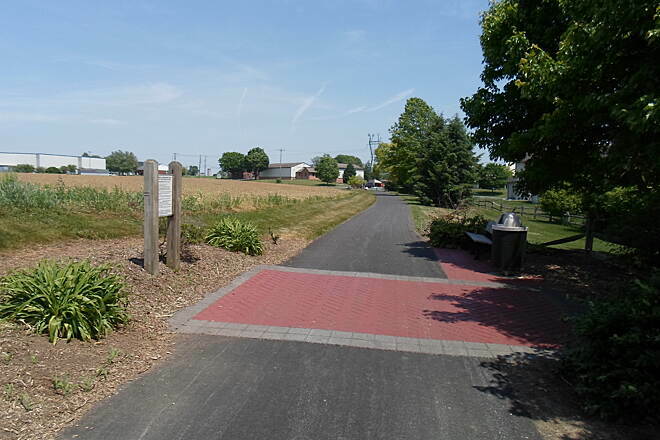 First trail junction: the Lititz-Warwick Trailway heads west behind the development, while the paved path seen going to the left is the Clay Road sidewalk. Taken May 2015. 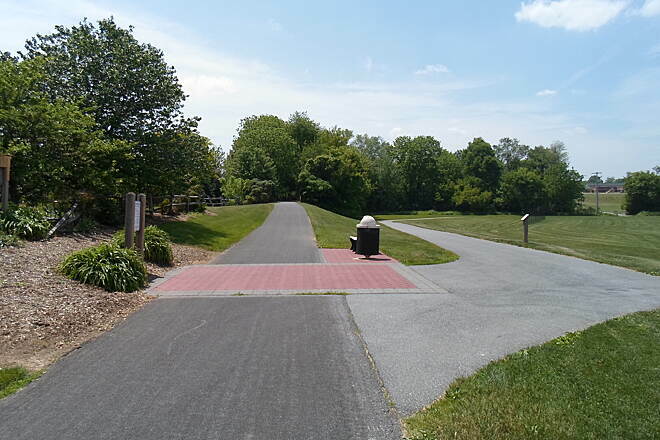 The Lititz-Warwick Trailway segment of the greenway currently (as of June 2015) ends at the Warwick Twp. 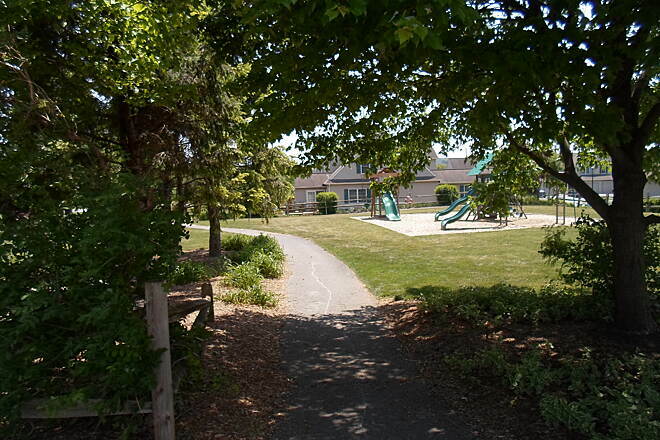 Municipal campus off Clay Road. 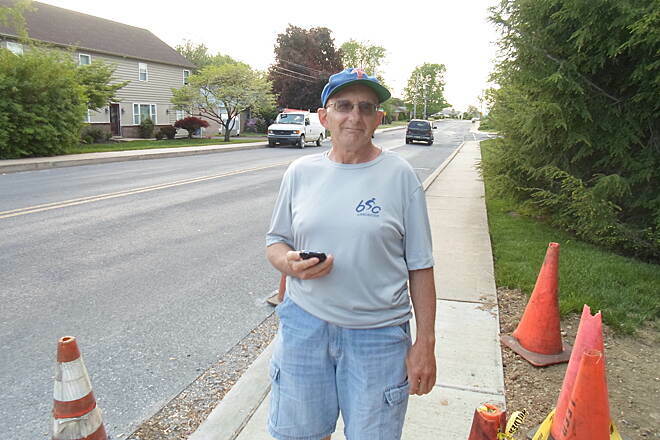 Township officials plan to build the next segment eastward later this year. 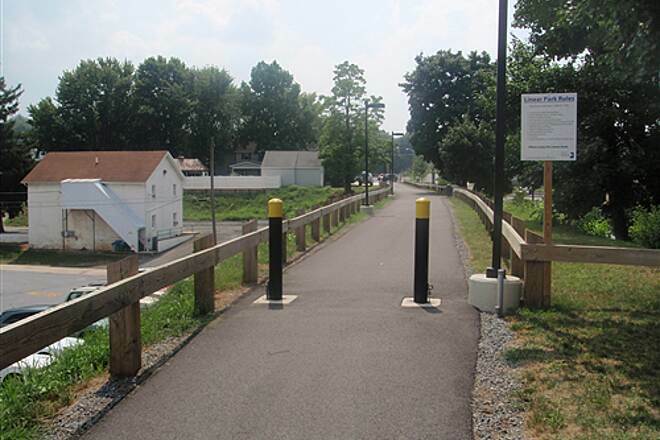 Sign greeting users to the western, completed portion of the trail in Warwick Twp. Taken May 2015. 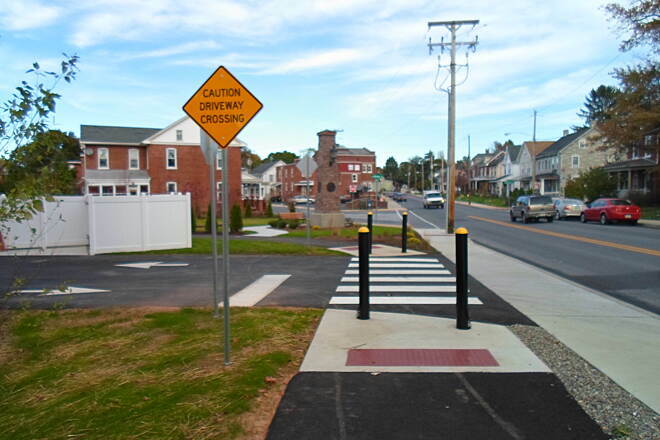 Signaled crossing at Clay Road on the western portion (Lititz-Warwick Trailway) next to the Warwick Twp. municipal campus. 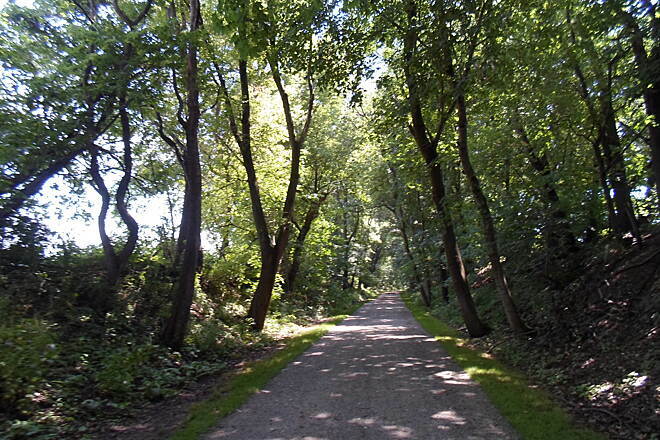 'Green tunnel' effect in northeast Akron. 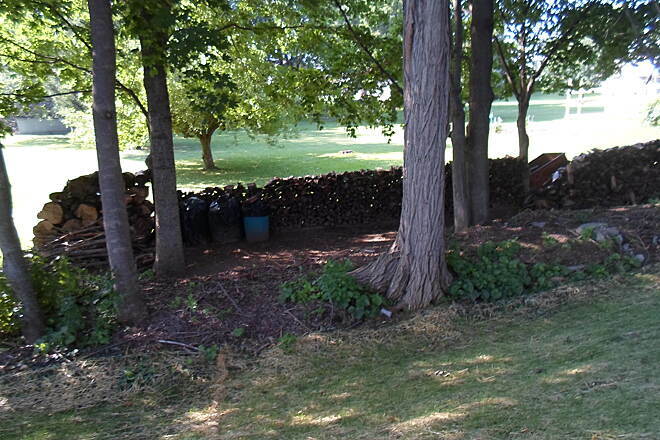 No, that's not the grim reaper in the shadow on the bottom left, lol! 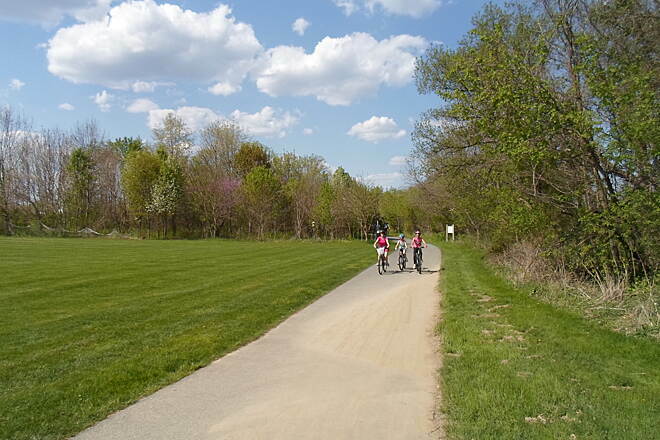 Cyclists on the trail in northeast Akron. Taken May 2015. 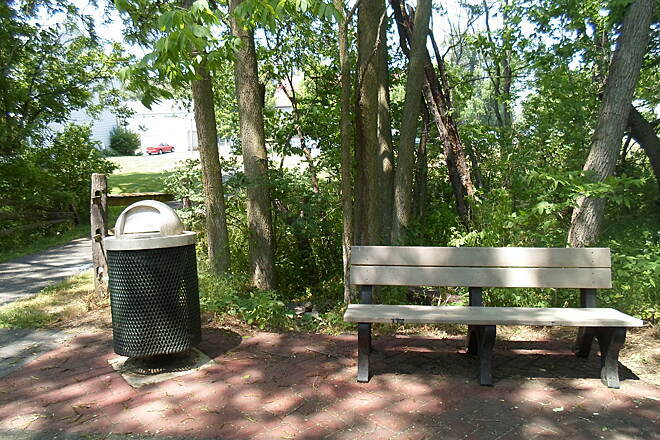 Benches and trash cans on both sides of the trail near Liberty Park in northeast Akron. 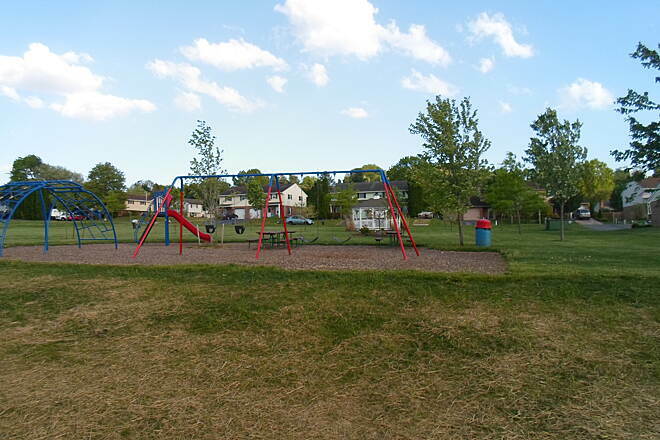 Liberty Park, located directly off the trail in northeast Akron. Jogger heading through northeast Akron on a warm, spring evening. Taken May 2015. 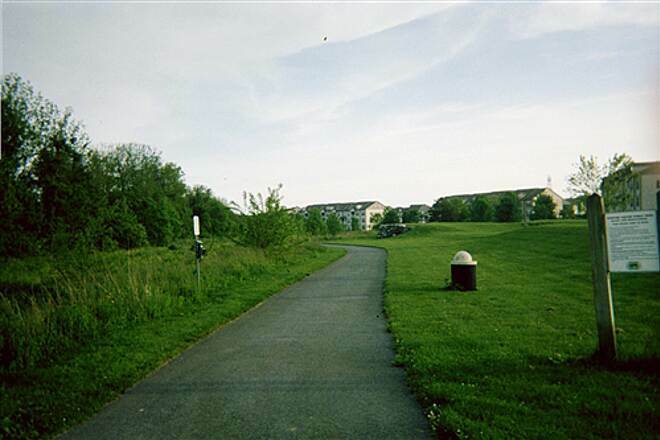 After passing the apartments and condos in northeast Akron, the trail enters open space and goes past Liberty Park, heading toward Ephrata. 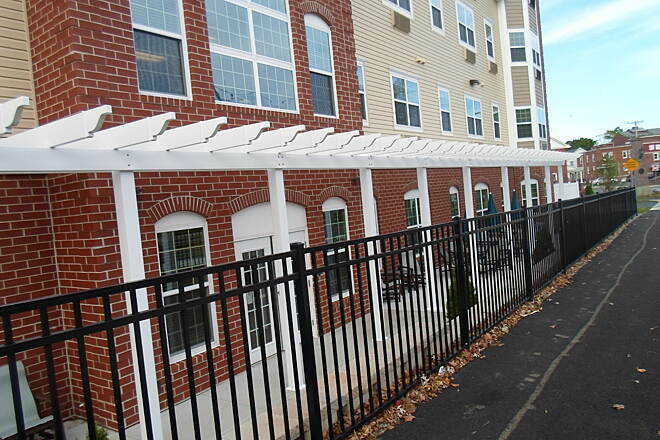 Another apartment complex adjacent to the trail in northeast Akron. 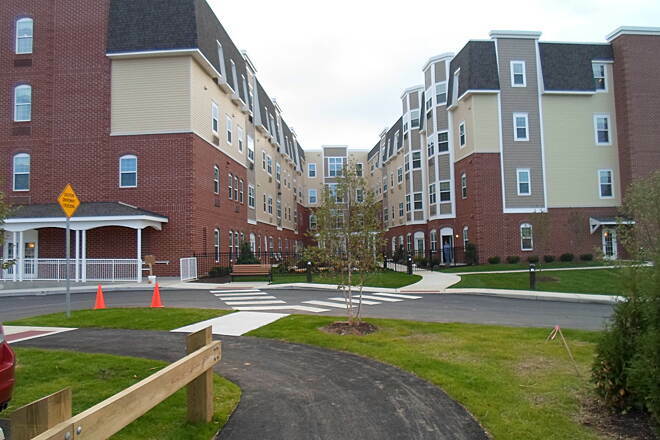 Passing the aptly named Trailside Apartments in northeast Akron. Taken May 2015. Heading east past condo and apartment complexes in Akron. 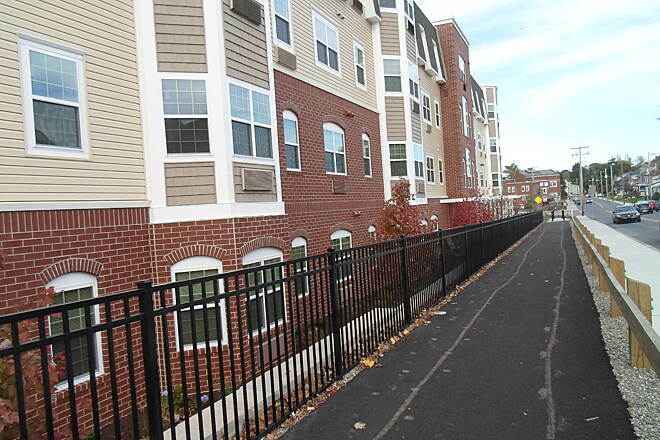 Looking north into one of the several condo complexes that line the trail east of Fulton Street in Akron. Taken May 2015. 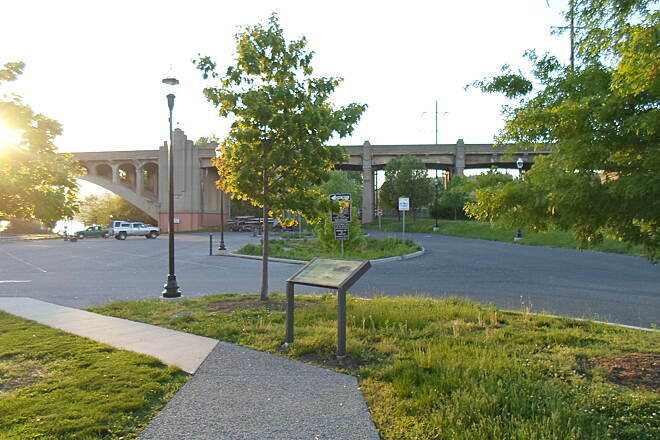 Approaching Fulton Street and Akron's trailhead. 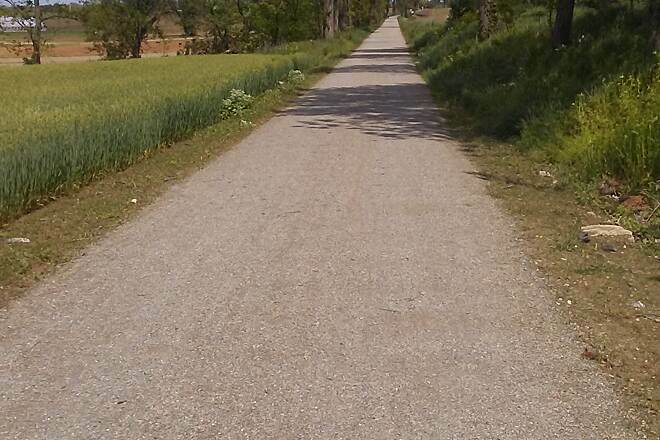 Taken May 2014. Blooming tree near the intersection of Fulton and Front streets in Akron. Taken May 2015. 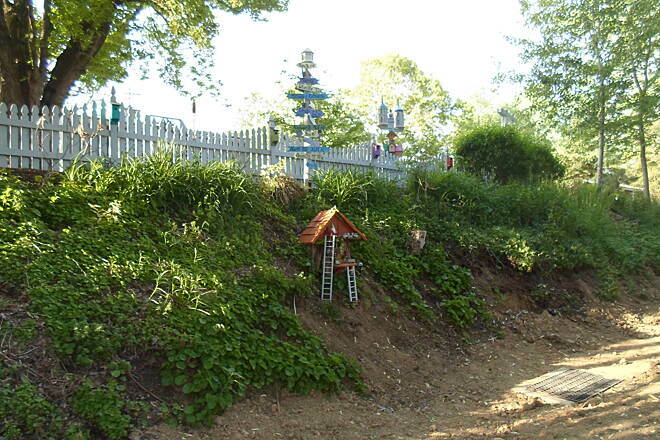 More yard ornaments, giving the new portion of the trail in Akron a quaint atmosphere. 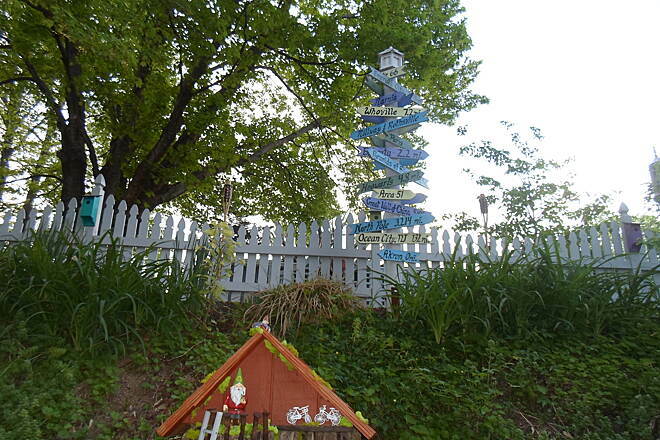 Directional sign and 'gnome house' decorating the trail behind a home in Akron. 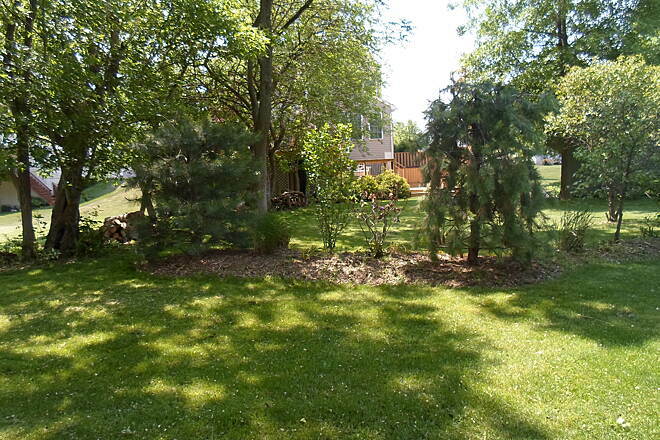 Bridhouses decorate the backyard of this home adjacent to the trail in Akron. 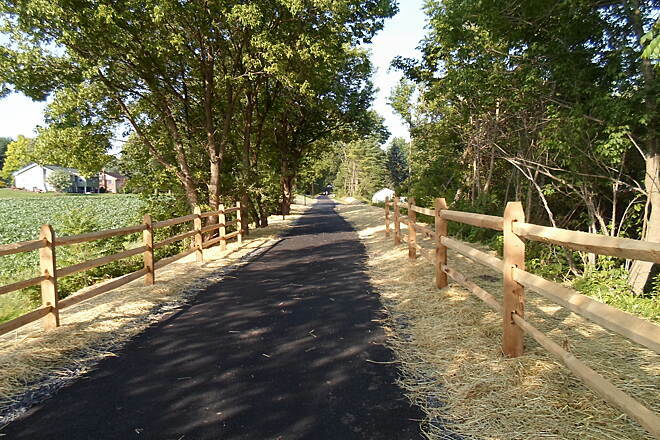 This Akron resident is one of many people who is proud of the new trail. Looking south on Main Street in Akron. Taken May 2015. Looking east from Main Street in Akron. Taken May 2015. Approaching Main Street in Akron. 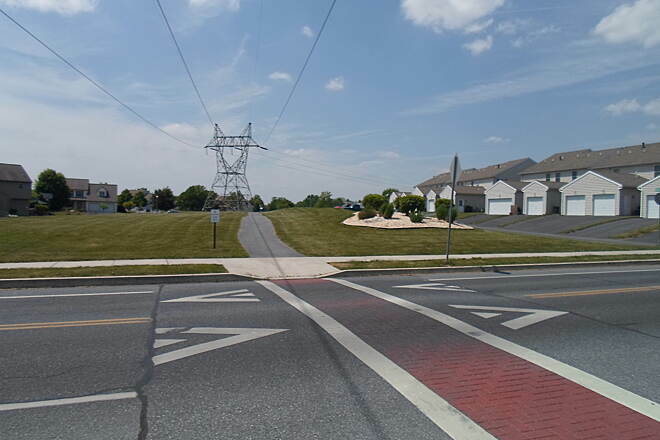 Though currently the western terminus on the segment of trail that starts in Ephrata, it will not be for long. 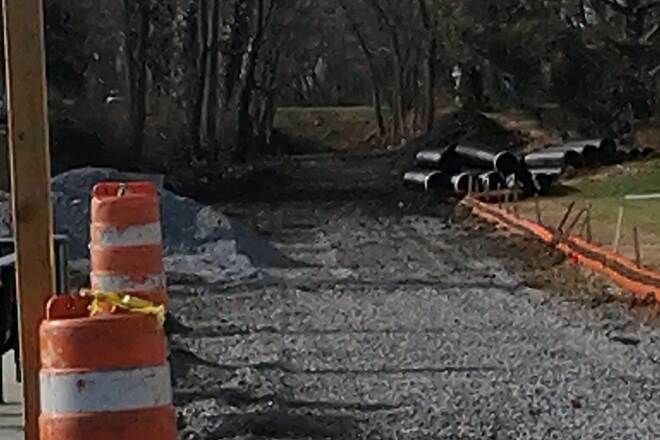 The next segment, which will extend further west to the Akron borough line, is already under construction. 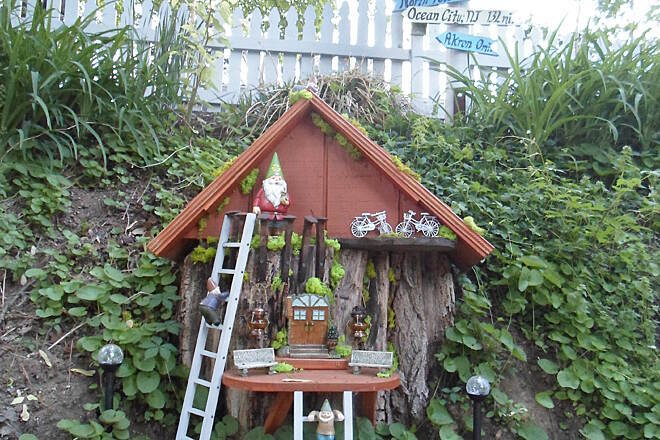 Situated immediately below the directional sign, this 'gnome house' is another neat decoration that residents who live next to the trail have recently erected in Akron. Taken May 2015. 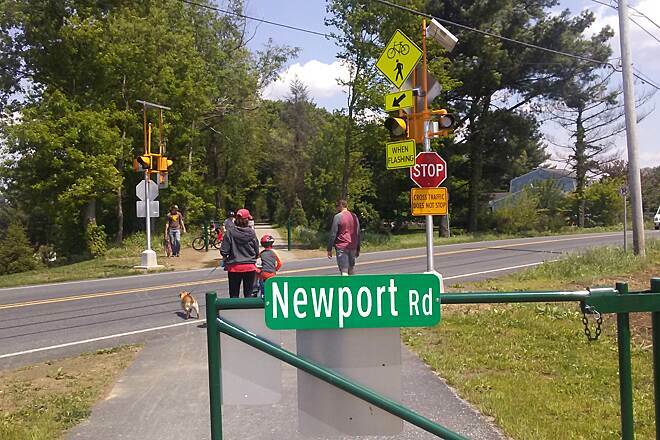 This unusual direction sign shows that some Akron residents are already taking advantage of their proximity to the trail. Taken May 2015. 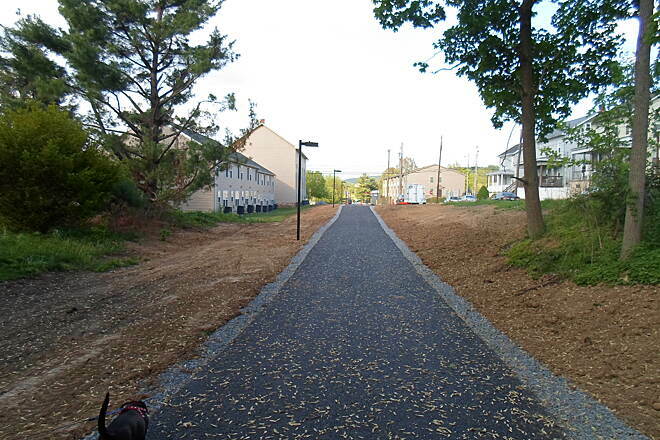 You can see the gradual, sloped grade of the trail between Main and Fulton streets in this pic. I was initially concerned when Akron officials voted to scrap the original plans to tunnel under Main Street, but everything turned out all right. 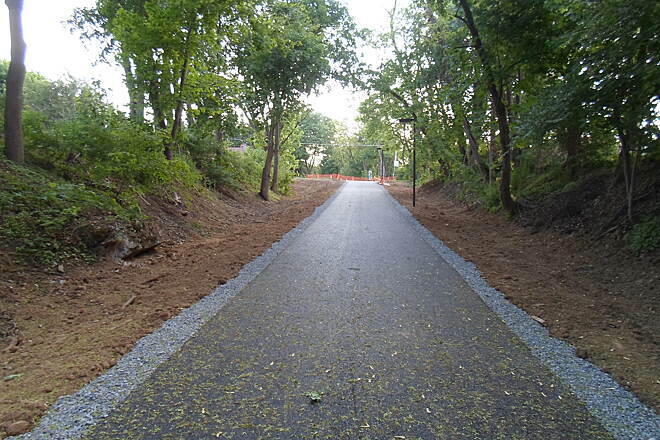 Looking west along the newest segment of the trail in Akron. 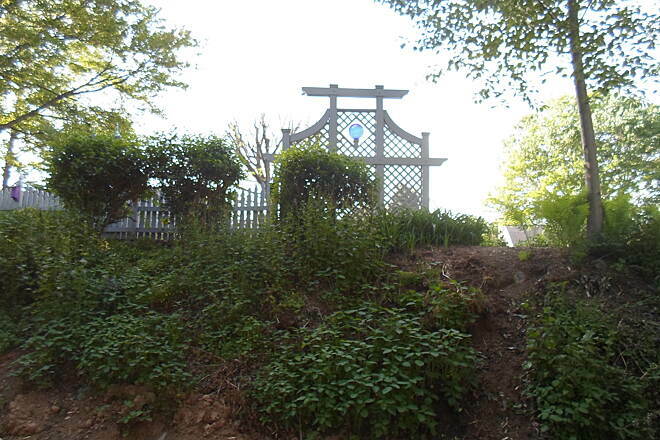 This section enters a wooded area and slopes gently up to Main Street. Taken May 2015. 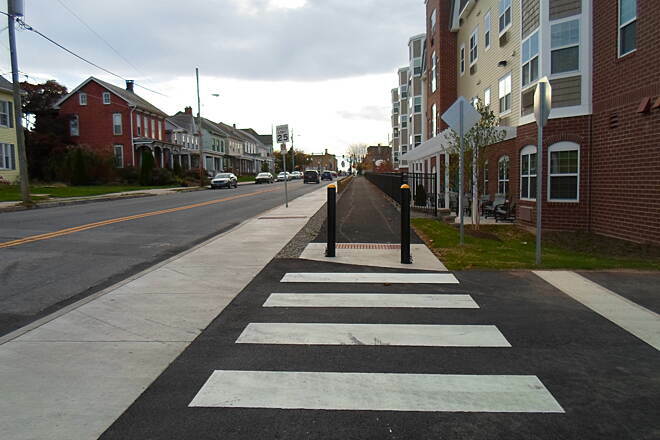 New trail access point at the corner of Front and Fulton streets in Akron. Taken May 2015. 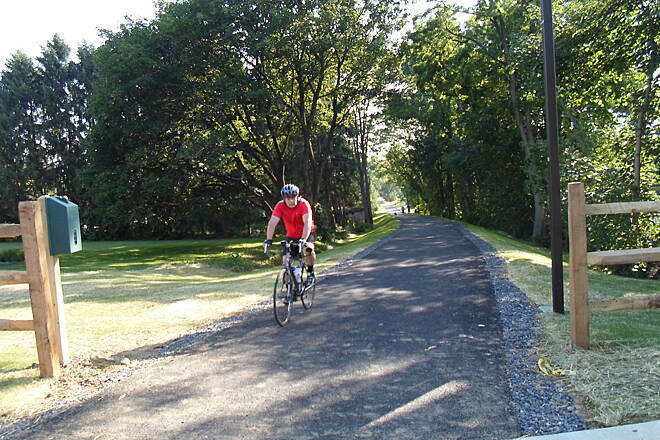 Cyclist heading west on the newest, completed segment between Fulton and Main streets in Akron. Taken May 2015. 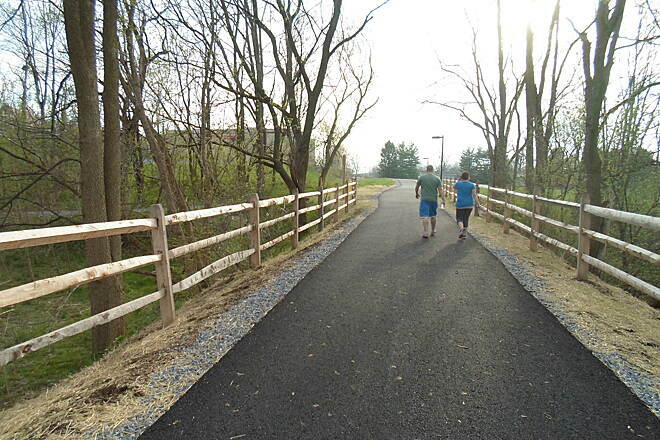 Couple enjoying a spring evening on the trail east of Akron in April 2015. Springtime skies. 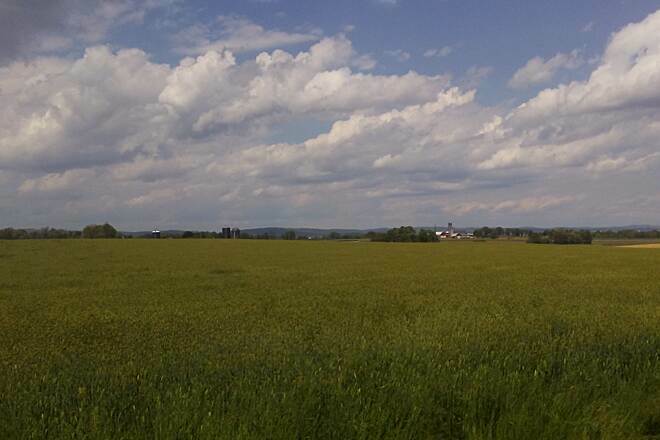 Taken April 2015 between Ephrata and Akron. 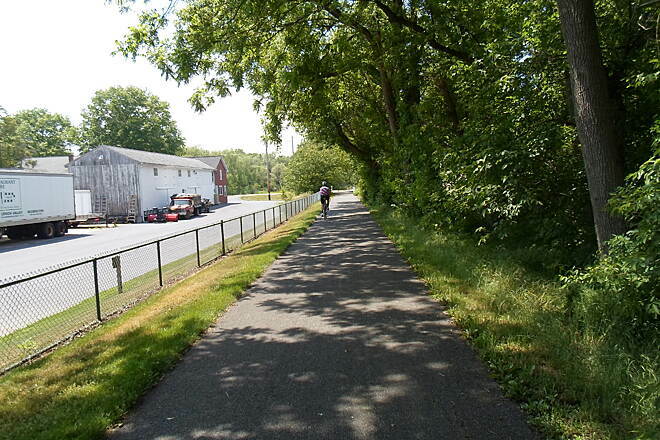 View of the trail from its east end in Ephrata. Taken April 2015. 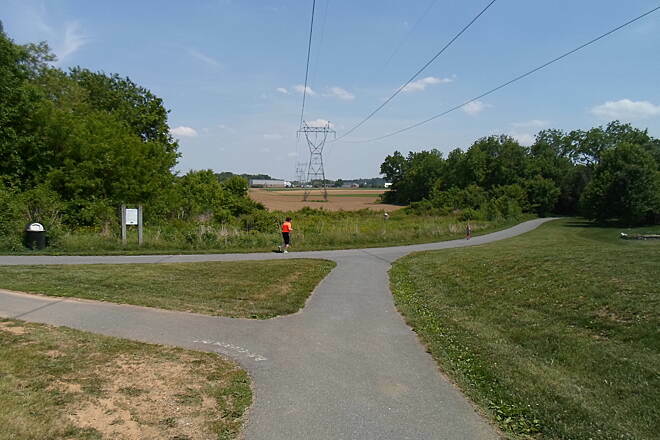 Junction point between the Major Winters Trail, seen on left, and the new, Warwick-Ephrata Rail Trail, seen on right, on Ephrata's southern end. Taken April 2015. From Fulton st to Broad st. This show the section under construction from Fulton Street to Broad ST. in Akron Borough. 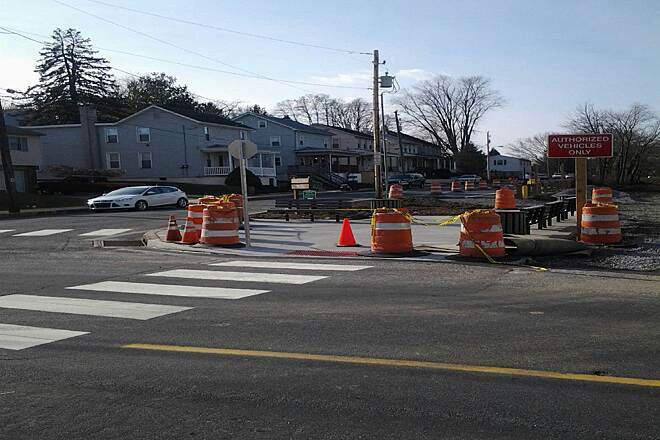 The Borough only decided in the Fall of 2014 to construct this segment as an 'at grade' crossing rather than install a tunnel. At Fulton street in Akron. 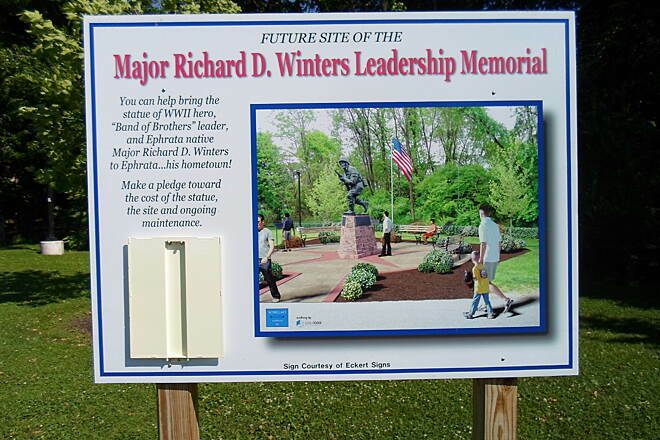 The capstone is intended to be the first part of a larger memorial to Winters that is planned to be built just south of the main trailhead off Fulton St.
Capstone commemorating the World War II veteran and town native for whom the trail is named. 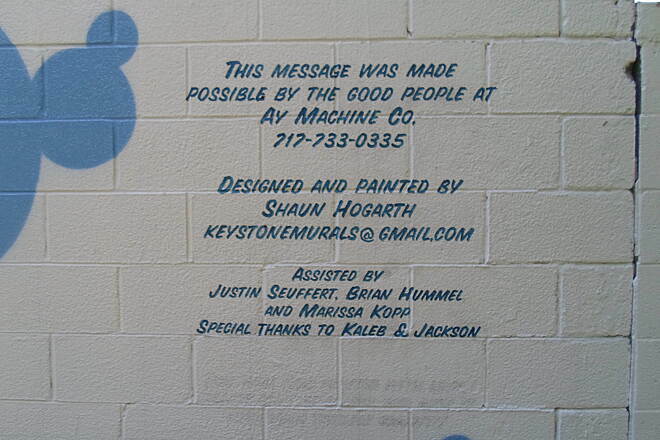 'Signature' on the side of the new mural. 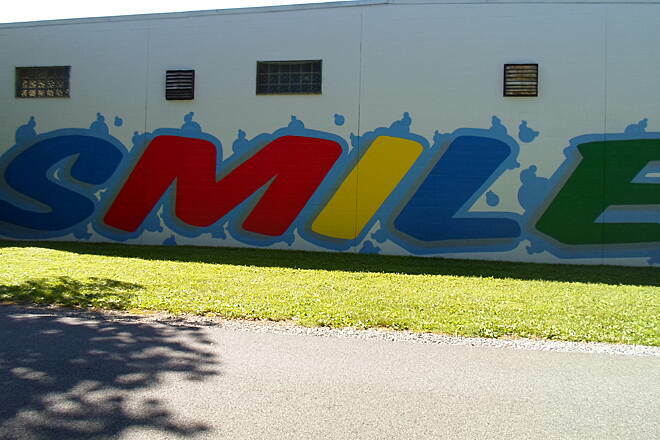 New mural painted on the side of an old factory. 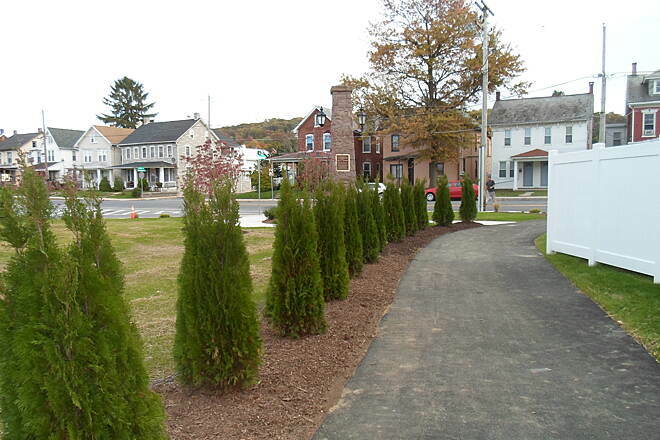 Newly planted cedar trees line the trail north of Keystone Manor. 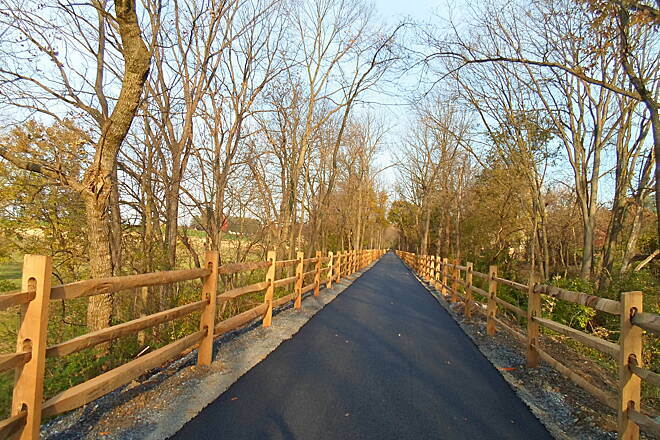 The people who built Keystone Manor are to be commended for constructing this newest segment of the trail. Taken October 2014. 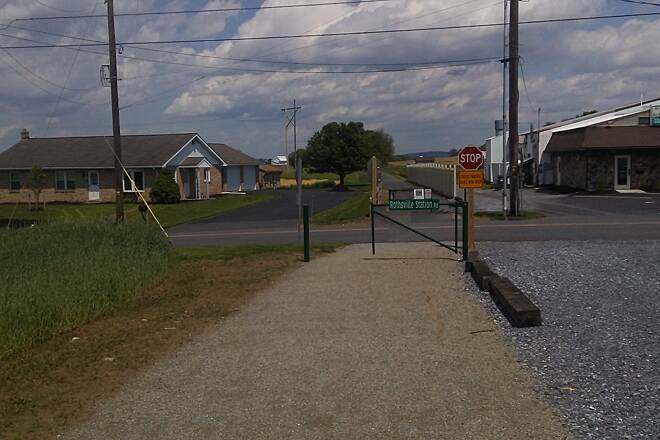 Northern terminus of the trail, as of late 2014. 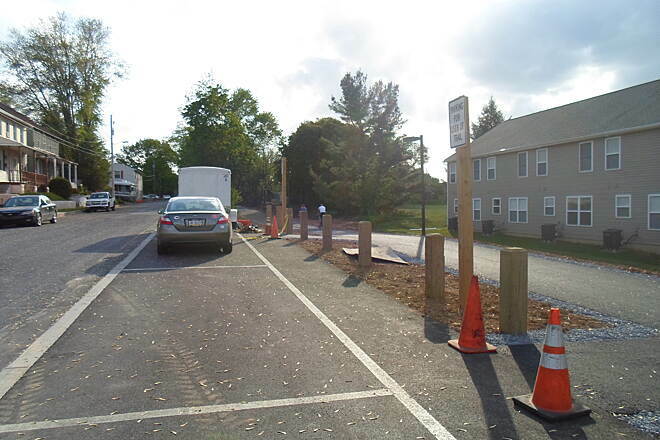 Chestnut Street is immediately north of the parking lot and future trailhead. 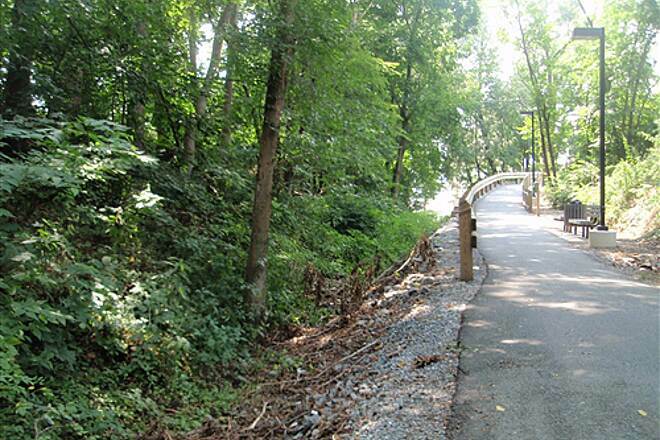 Work to extend the trail north to Pine Street, at the borough's north end, could begin next year. Taken Oct. 2014. 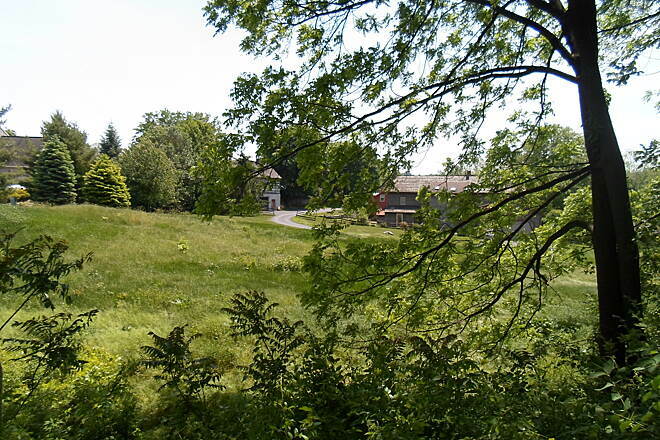 Looking south toward Keystone Manor on the borough's north side. 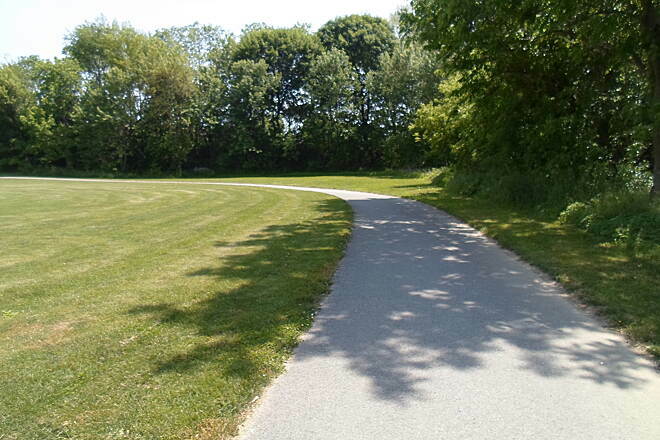 After manouvering around the north side of Keystone Manor, the trail again turns north, passing just west of a parking lot. 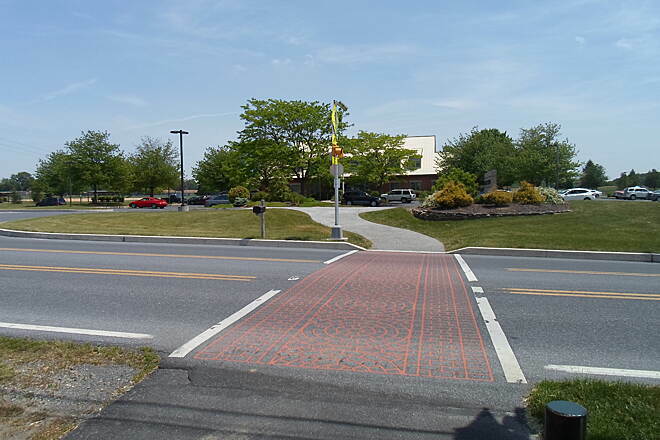 Crossing parking lots north of Keystone Manor. Taken October 2014. 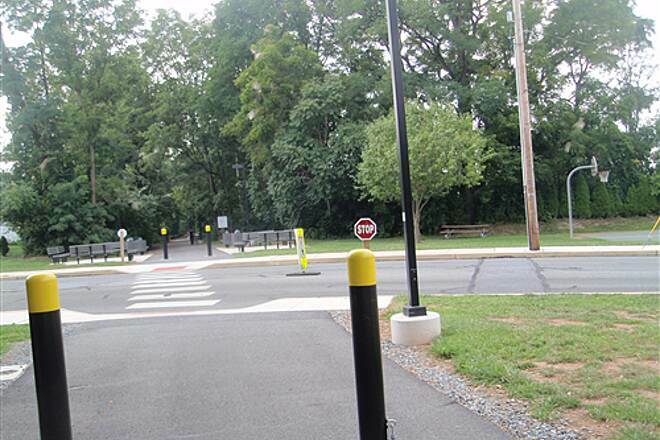 A winding crosswalk guides trail users around the north side of Keystone Manor. 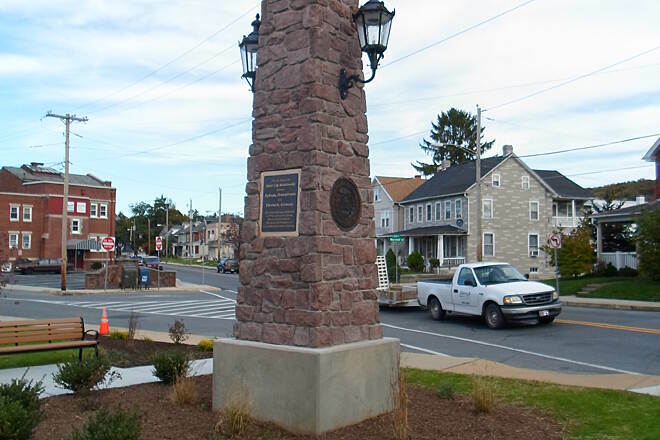 Rounding the bend behind the Ephrata-Eberbach monument. 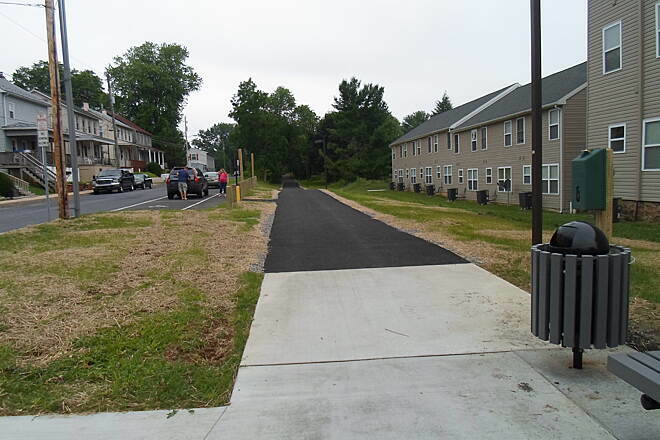 Looking south down the trail, paralleled by a sidewalk and State Street alongside Keystone Manor. 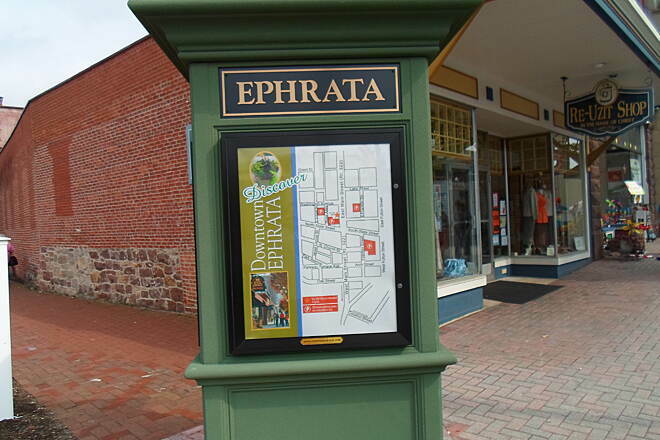 More symbols on the Ephrata-Eberbach monument. Taken October 2014. 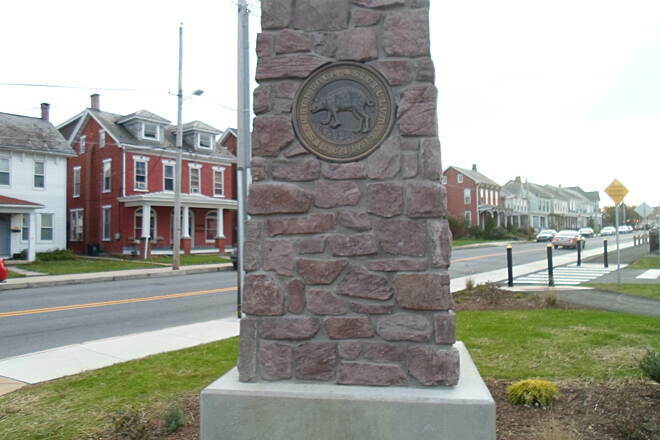 Eberbach coat-of-arms, on the side of the monument near the trail's north end off State Street. 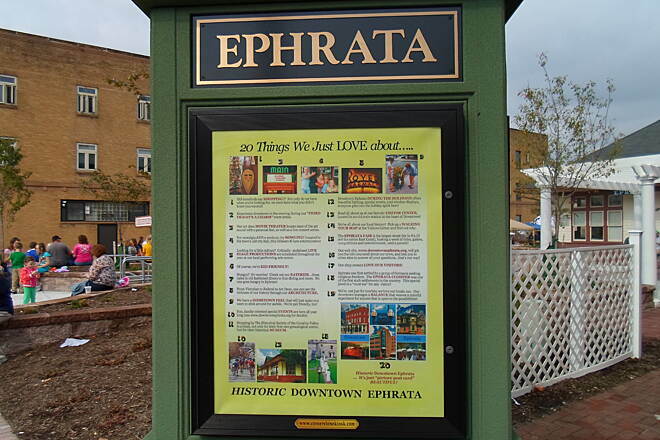 This plaque, describing the 'sister city' relationship between Ephrata and Eberbach, is one of several on the monument. 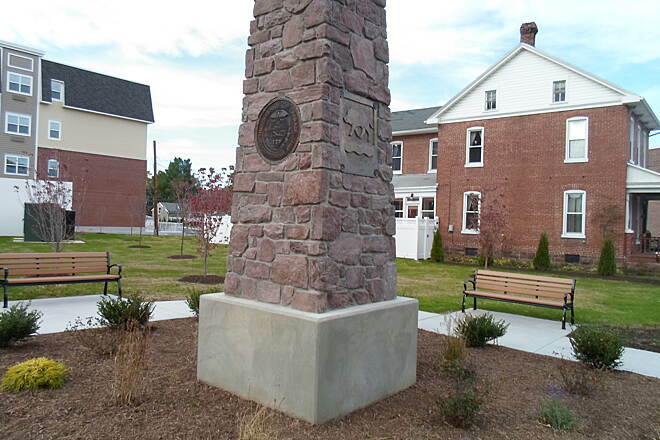 The Ephrata-Eberbach monument, from another angle. 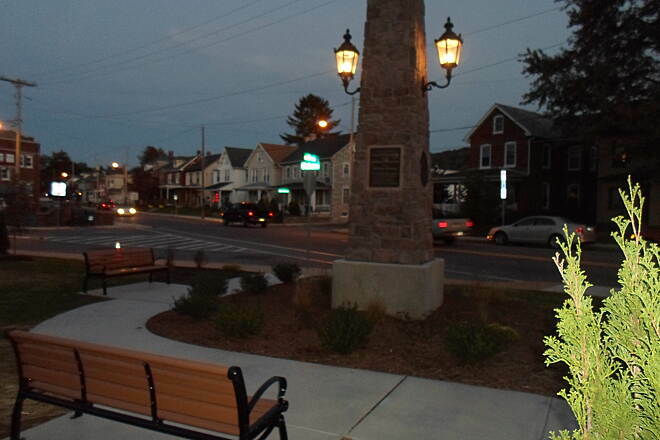 The Ephrata-Eberbach monument at dusk. Taken on an unseasonably warm evening in October 2014. 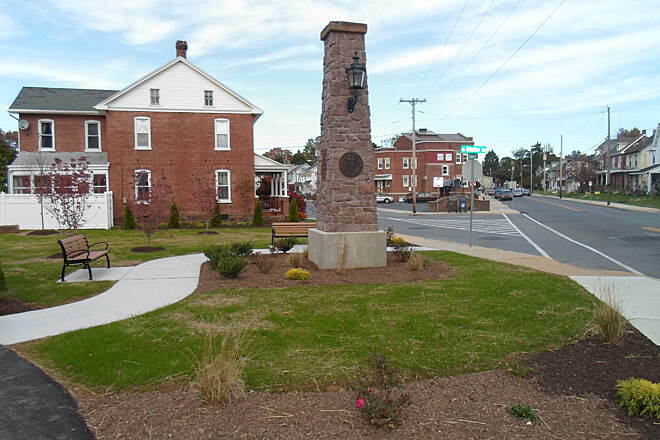 The trail passes the town's newest monument commemorating its partnership with Eberbach, Germany, at the intersection of State and Duke streets. 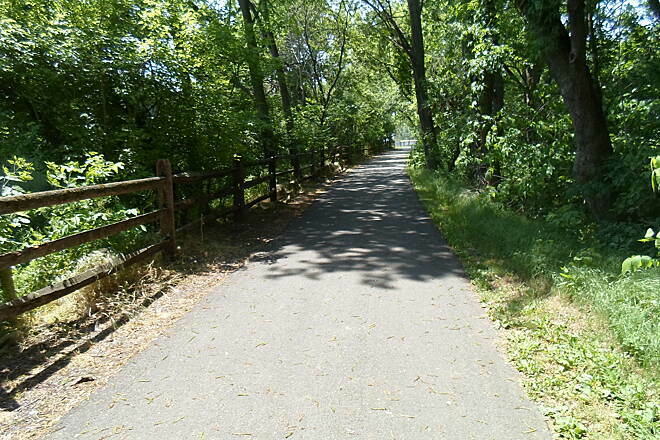 The trail turns away from State Street just north of the Keystone Manor complex. 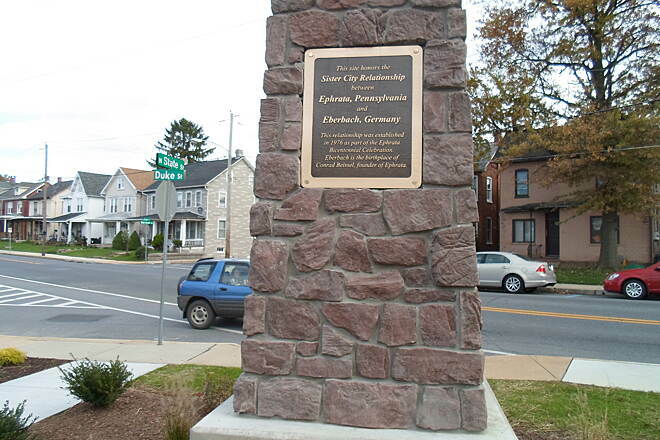 The newly constructed monument commemorating the borough's partnership with Eberbach, Germany can be seen in the foreground. 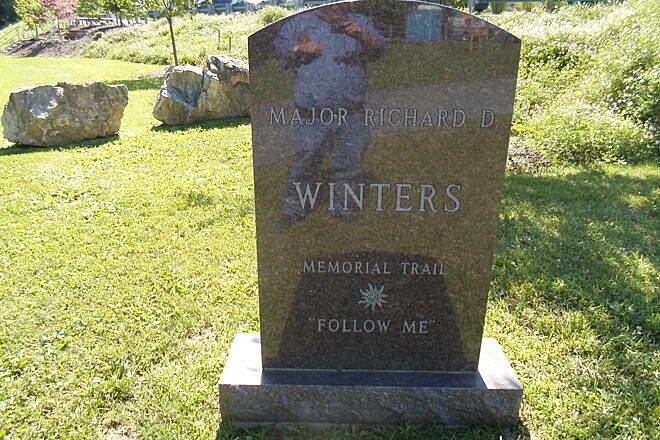 Taken Oct. 2014. 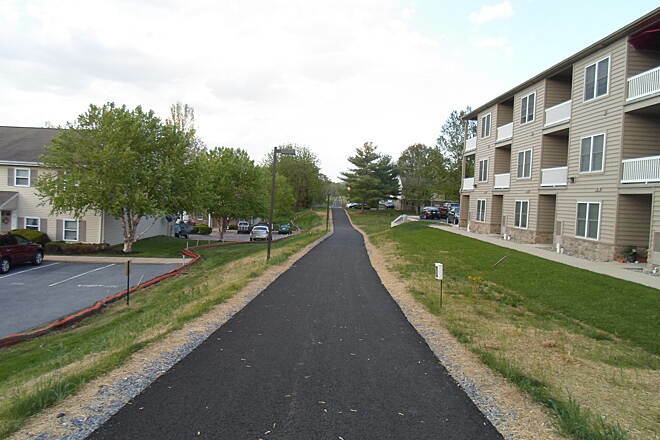 The trail enhances quality of life for residents of Keystone Manor. 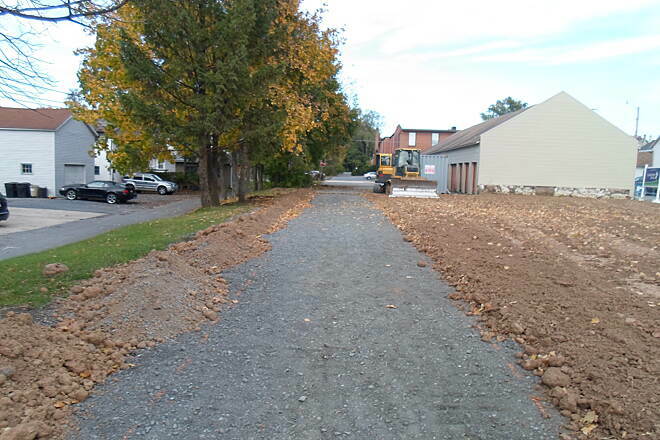 Threading a path between the east side of Keystone Manor and State Street. Taken October 2014. 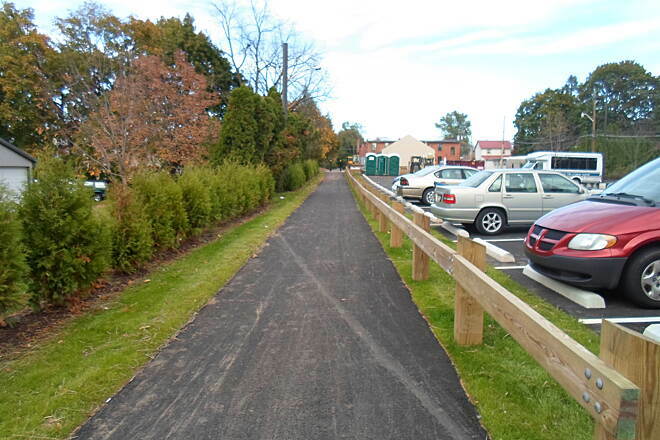 The newest completed segment (as of Oct. 2014) of the trail parallels both State Street and a sidewalk east of Keystone Manor on the borough's north side. 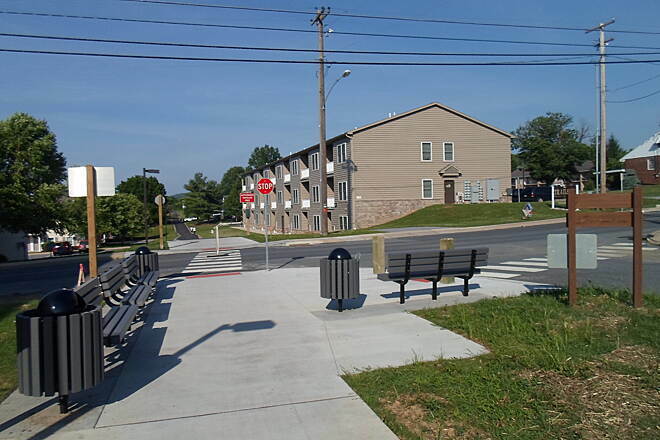 Another view of the new kiosk along the trail immediately north of E. Main Street. 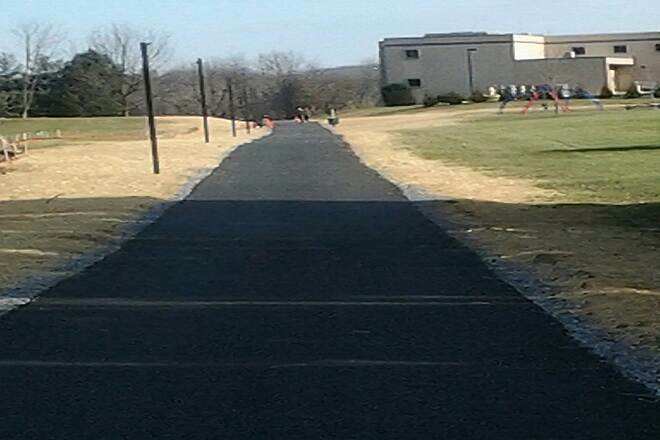 The trail, paved in brick, can be seen in the background. New kiosk by the train station, off E. Main Street. Unfortunately, it does not include a map of the trail. 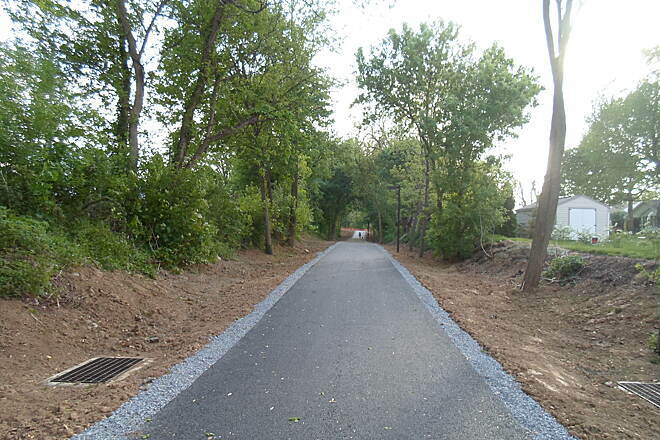 Approaching the new junction with the Pomeroy Newark Rail Trail. 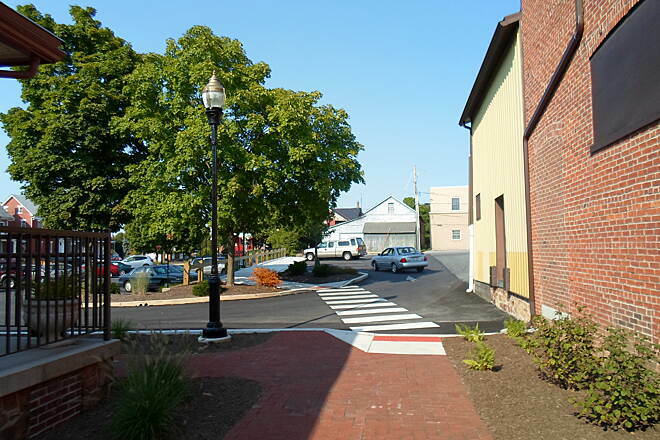 View south past the train station to Main Street. 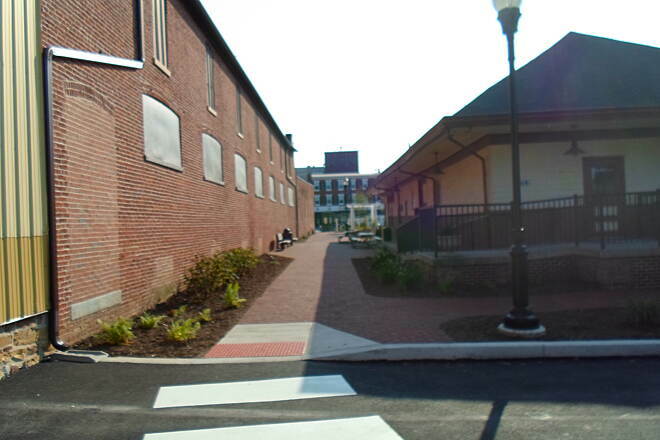 The trail surface turns back to brick by the caboose at the current northern terminus at State Street. 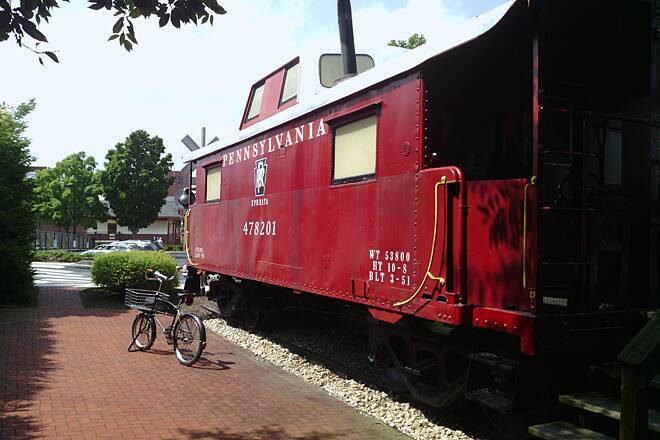 The caboose and adjacent mural and train station are great monuments to the railroad's past. 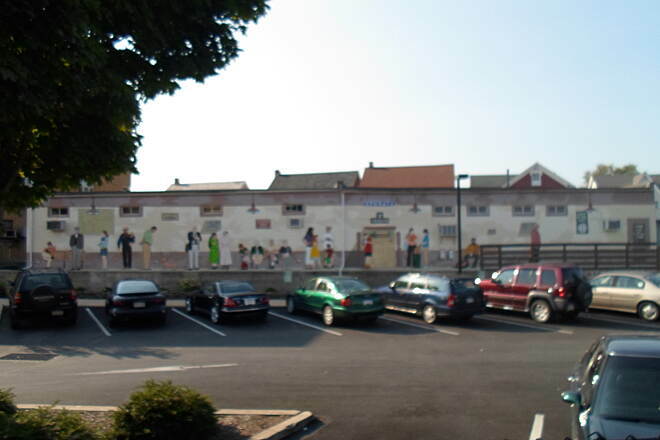 This mural, visible from the trail behind the train station, depicts passengers waiting for the train on a loading platform that was in place back when the railroad was still in use. Immediately north of the train station. 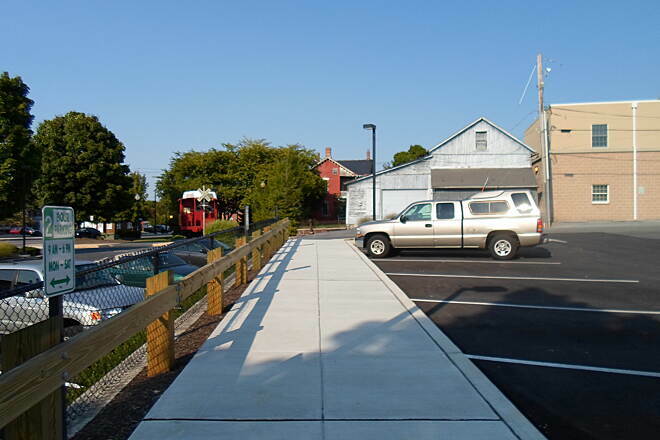 The trail is paved with brick between E. Main Street and the parking lot, and concrete from the parking lot to the caboose off State Street. 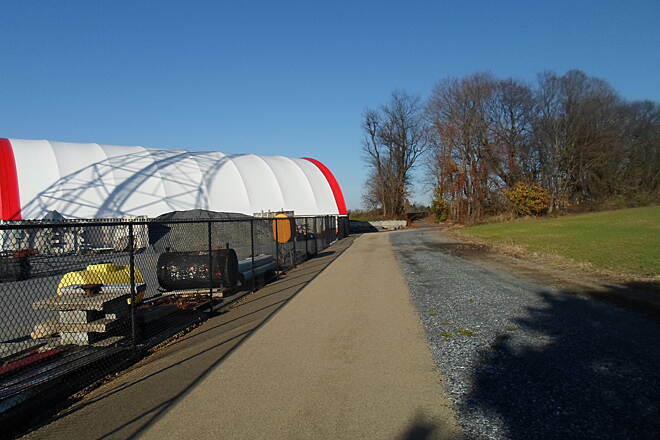 The trail was recently extended another 1500 feet north through the property of the old borough train station. 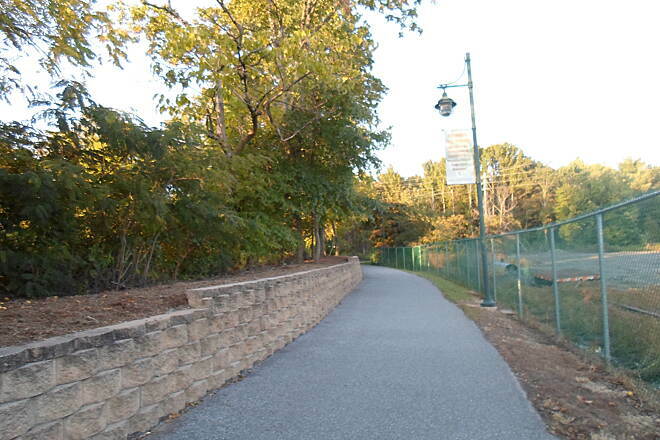 This portion of the trail, immediately north of the station, is paved with concrete. 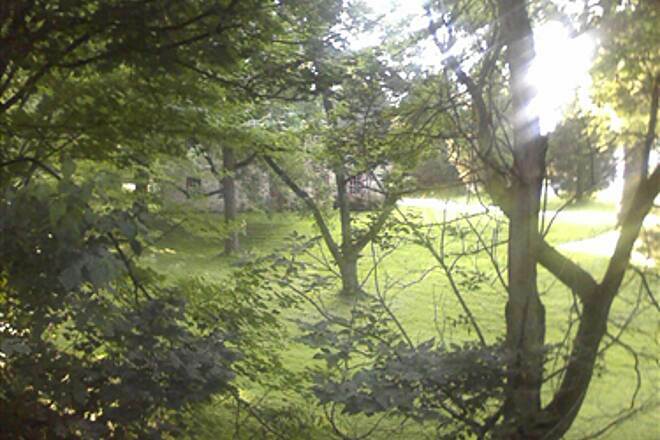 Taken August 2012. An old factory formerly served by the rail road. 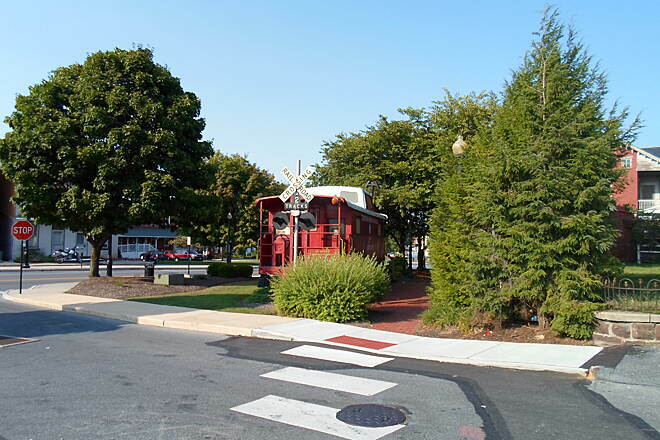 Caboose near the trail beginning by the former Ephrata train station. 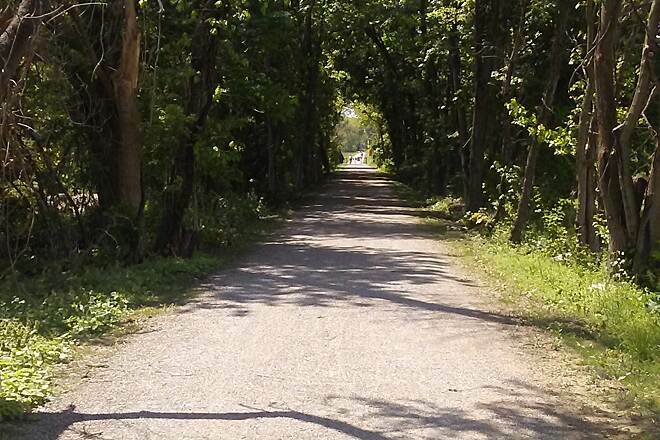 Picture taken along the branch path north of the main trail. 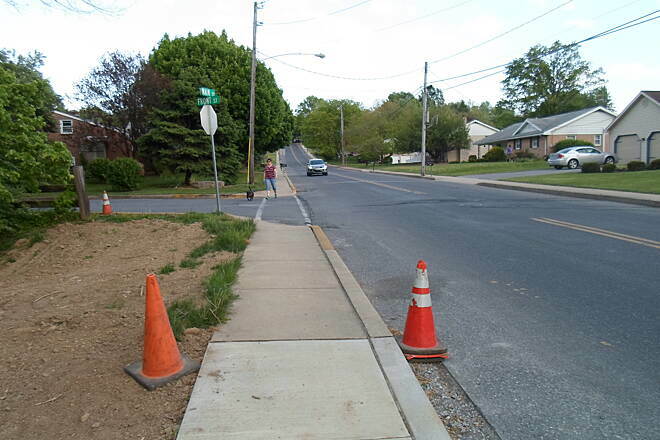 The right spur leads up to Newport Road, while the left fork follows a powerline right-of-way to Oak Street. 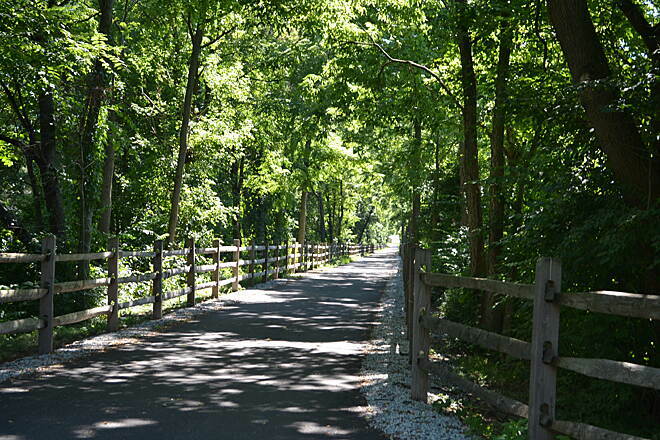 Heading north on the branch trail, approaching Newport Road. 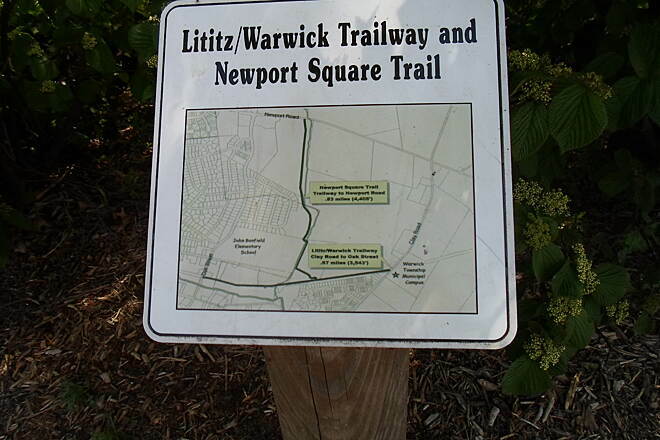 In addition to the main portion of the trail, which runs from the east end of Lititz to the Warwick Township Municipal campus, there is a branch trail that extends north along a local stream to Newport Road. This pic was taken on that trail. 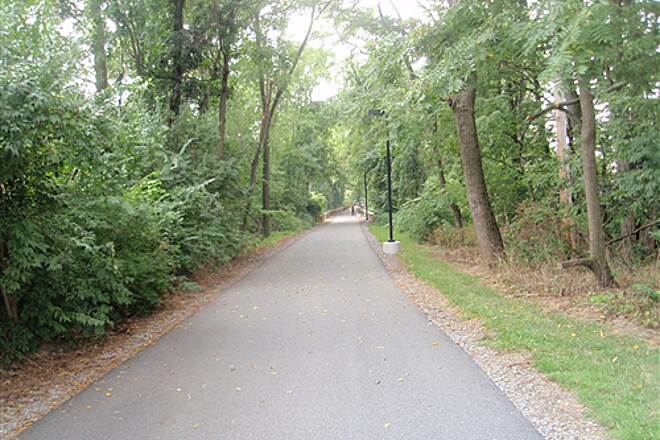 North of Fulton Street, the trail enters the downtown, taking on a more urban feeling. 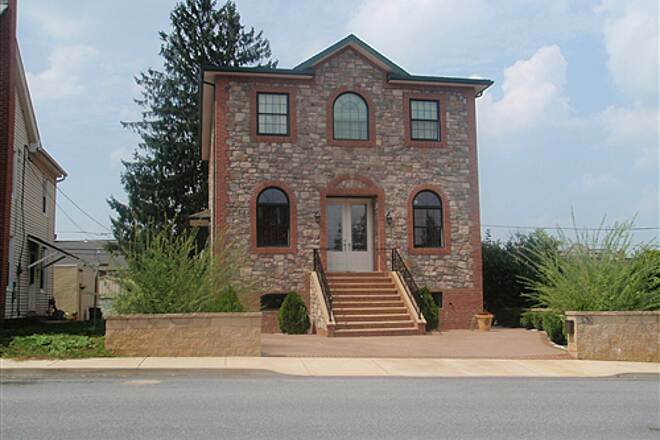 Pretty, brick home off Railroad Ave., across from the parking lot and trailhead. 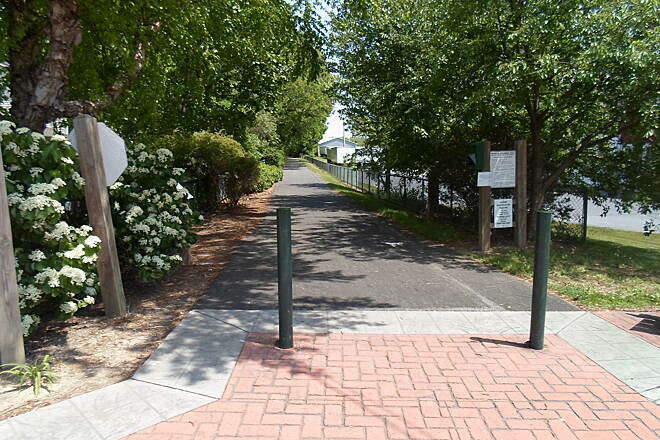 Approaching the trailhead off Fulton Street and Railroad Ave. 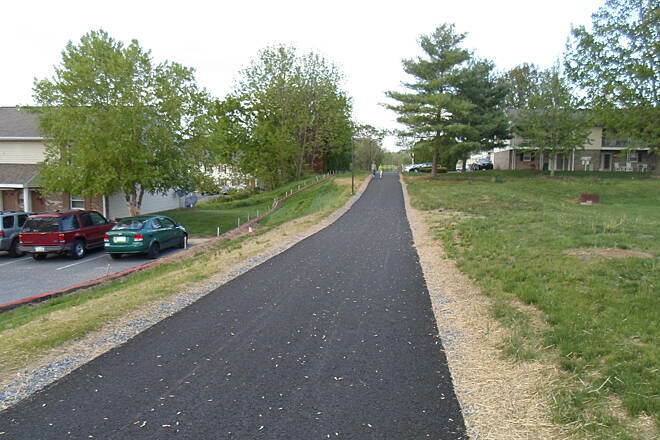 The parking lot provides ample space for trail users. There is a chemical toilet, too. Looking east from PointView Ave. 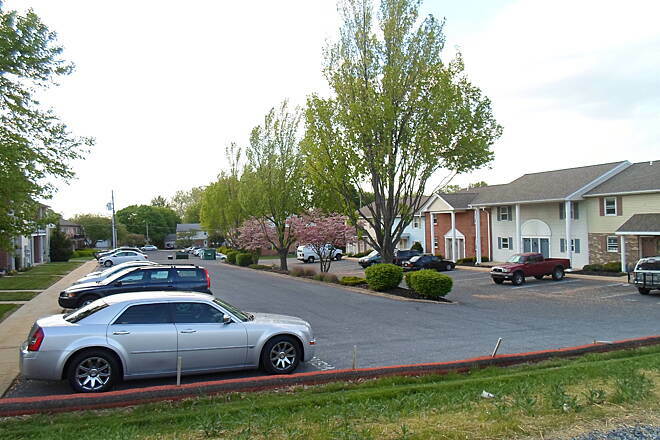 The ramp is located just behind the building on the left. 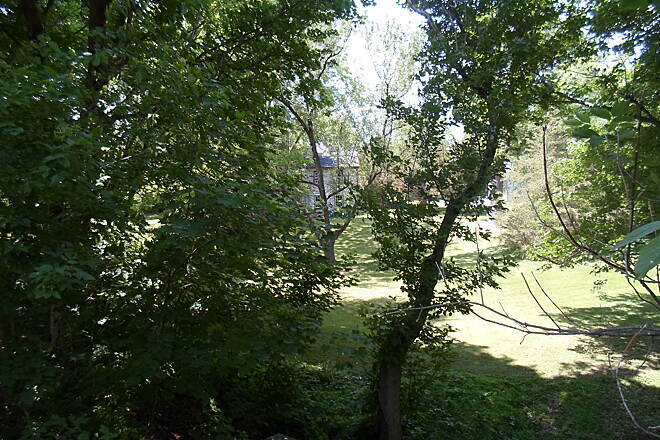 Looking down from the Linear Park onto the unpaved Brickyard Trail. 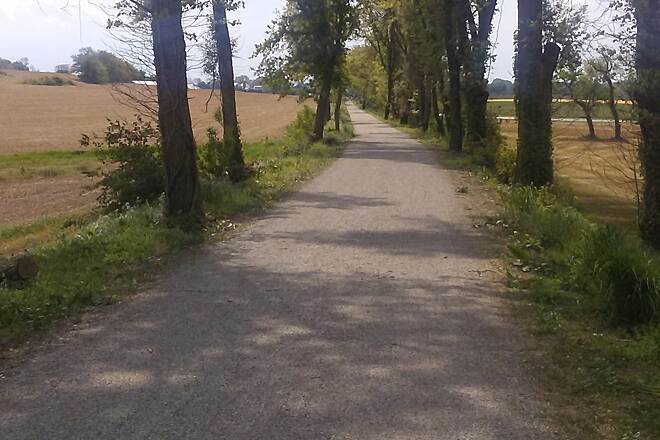 The trail is very user-friendly. 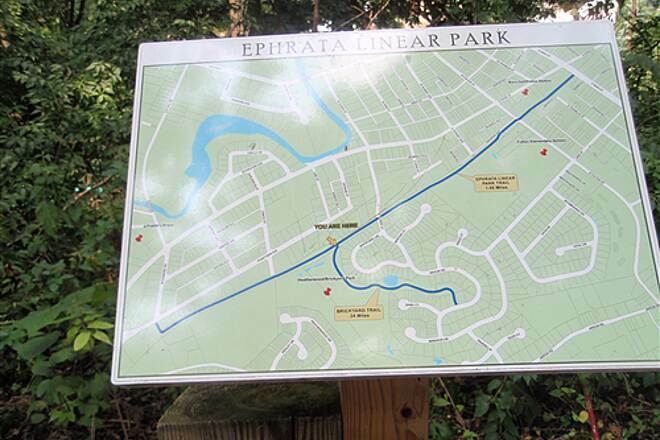 This sign, located south of the Mason Drive crossing, shows a detailed map of the borough's emerging trail network. 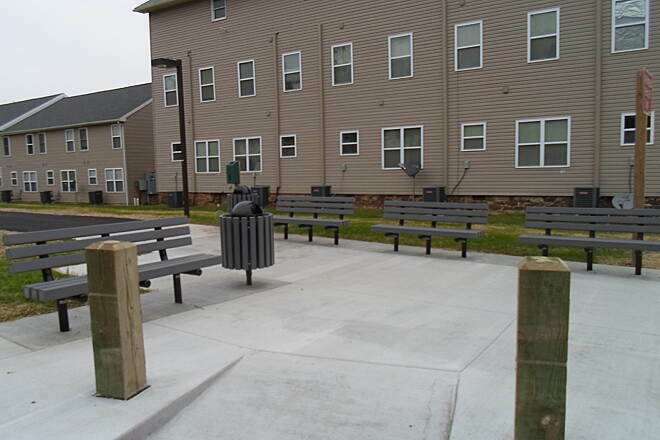 In addition to the trail, the Linear Park also features this basketball court, located off Mason Drive, and a mini-plaza with benches and trash cans. Very nice. 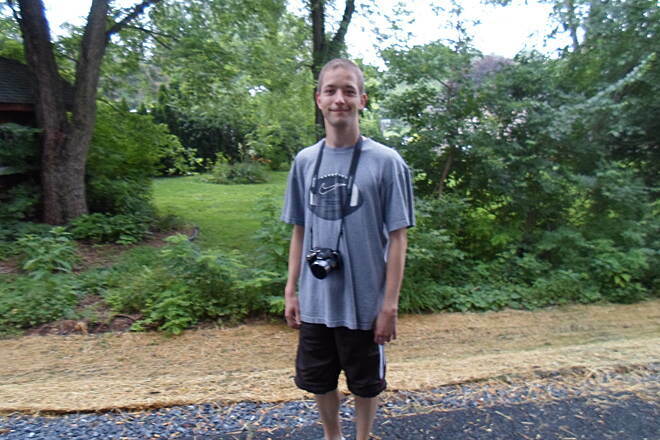 Taken Aug. 2010. 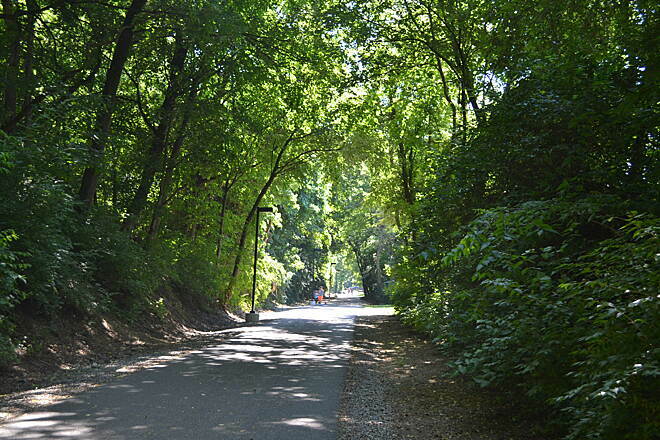 South of Fulton Street, the trail enters lush, wooded areas. 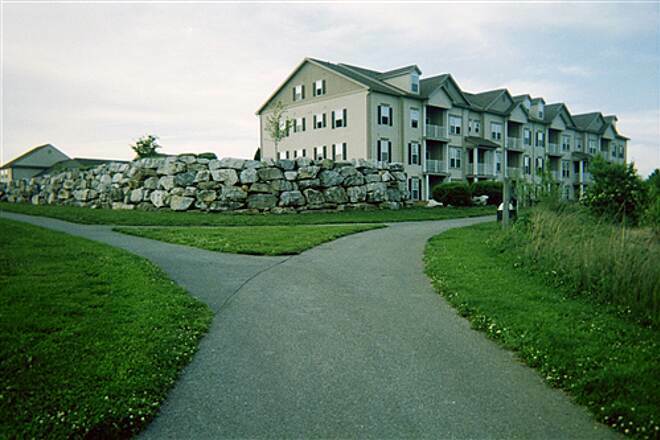 If not for the homes and small factories that can be seen nearby, you would never realize you were in the middle of a town. 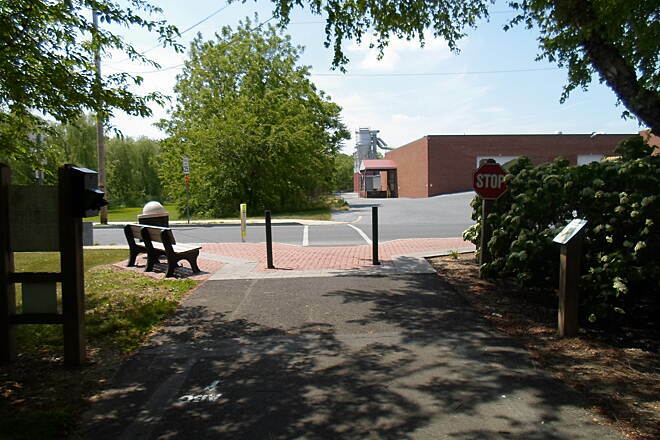 These steps connect the Linear Park and Elementary School trails with Railroad Ave. 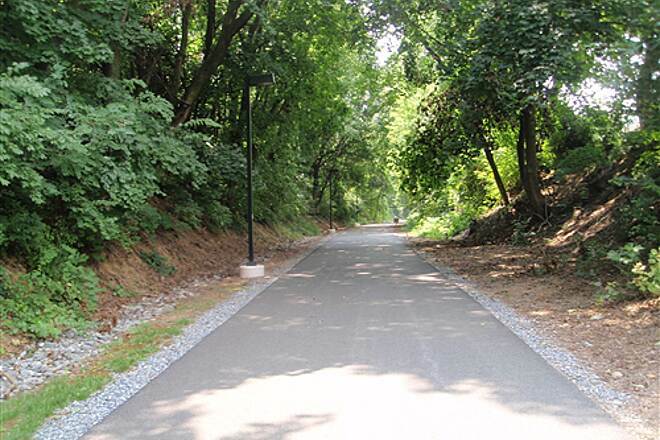 This branch trail connects the Linear Park to nearby Fulton Elementary School, and could be considered a greenway in its own right. 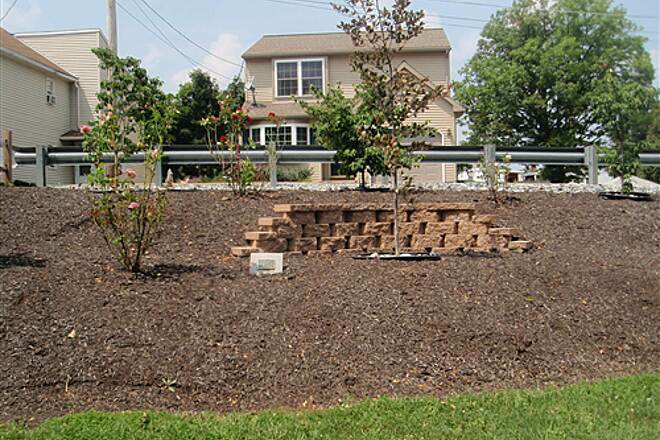 A small garden adds some beauty to the trail off Railroad Ave. Taken Aug. 2010. Looking south from the trailhead off Fulton Street and Railroad Ave.